Please find attached agenda for the General Meeting to be held at the Roma Administration Centre on November 13, 2013 at 9.00am. I have recently been approached by Council staff to ask if the User Group at the Surat Racecourse Reserve refer to this area by the same name as Council, due to Council staff designing and constructing a sign for the entrance to this area. 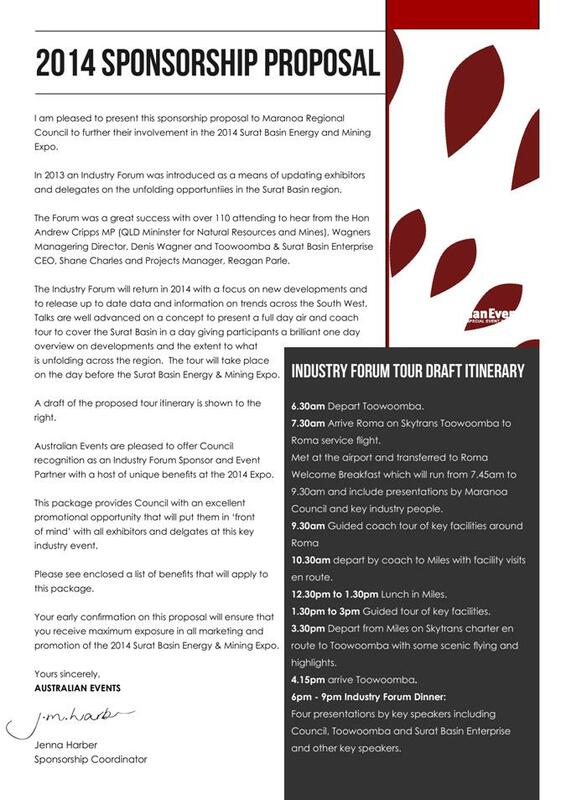 After a discussion with the executive of the groups that use this area, I responded that we would like to go to the community to ask their thoughts regarding an official name for the Surat Racecourse Reserve. I am aware that Council are having a sign designed to be placed at the front entrance and this would be good timing to suggest a name change to this area for Council consideration, if the community so desire. Executive members of the User Group agree and would like to gauge the level of support for a name change with the local residents. 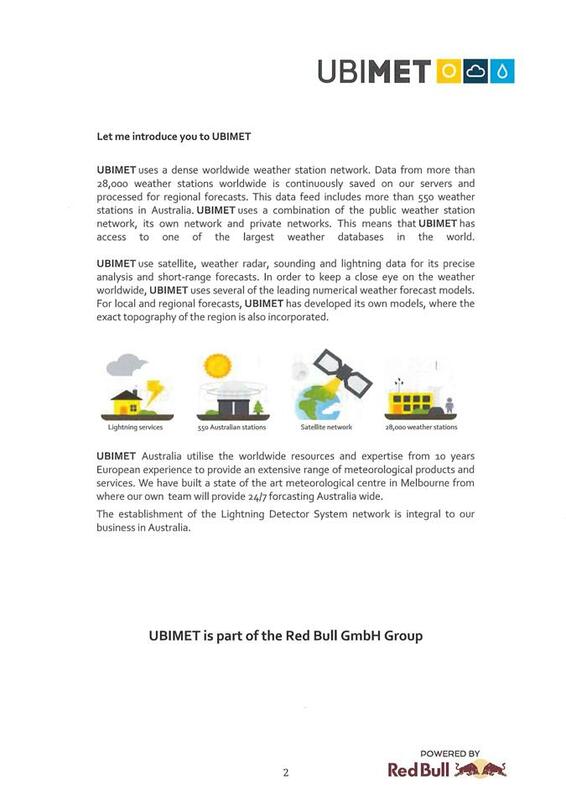 Can you please advise if Council support this idea and if so, can Council staff assist the User Group to send a survey out to community members. The names we would like to survey are Surat Racecourse Reserve and Warroo Sporting Complex, with an opportunity for residents to also include their own preference. 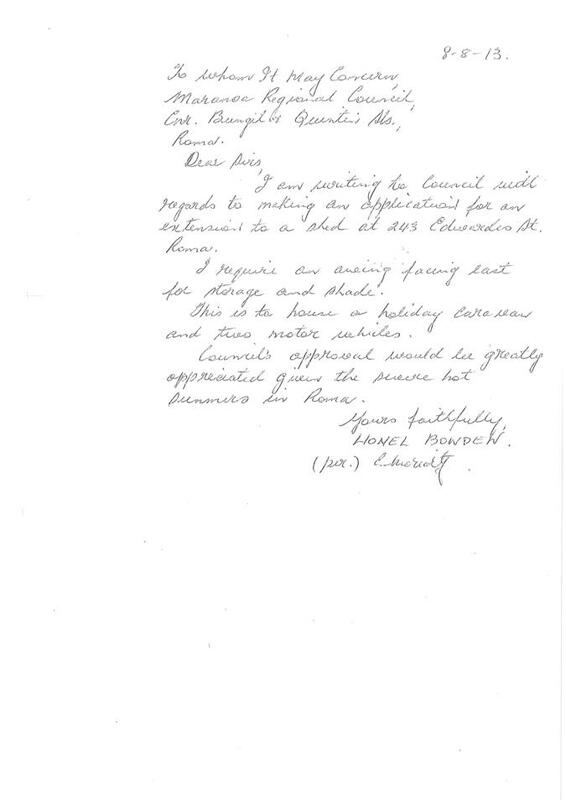 Thank you for your correspondence addressed to Councillor Scott Wason dated 23rd July 2013, outlining your request for Council to provide a gravel pavement to Nareeton Road. I have undertaken an initial review of your concerns raised and have allocated this matter to Kylie Fleischfresser (Coordinator Infrastructure Planning) for further investigation. 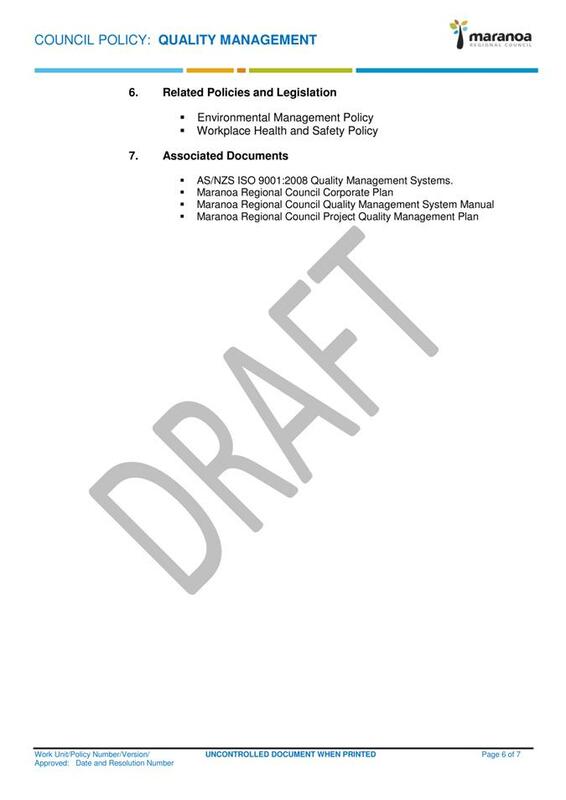 Following this investigation, a report will go to the Council meeting of 23 October 2013 for resolution. Following this meeting I will advise you of the outcome. Again, thank you for bringing this matter to the attention of Councillor Wason; I will continue to keep Councillor Wason informed as the matter progresses. 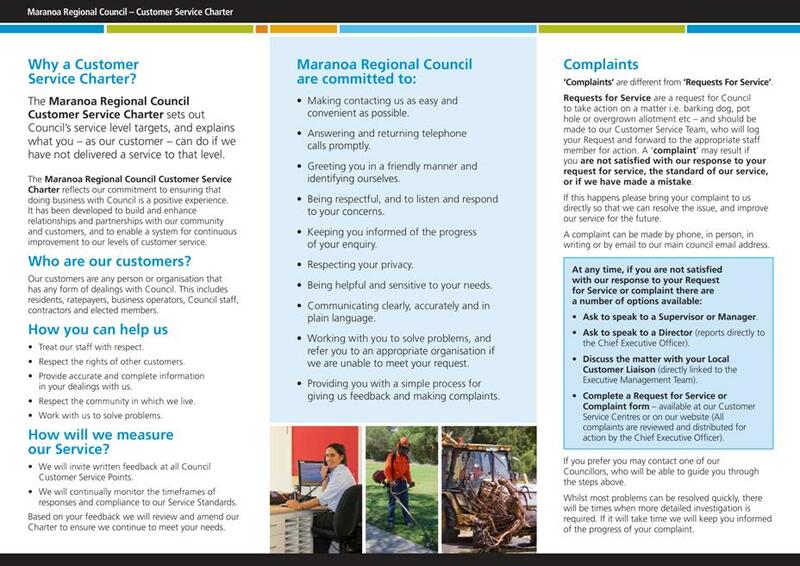 Please do not hesitate to contact Clara Aitken of my office on (07) 4624 0712, or by email – clara.aitken@maranoa.qld.gov.au, if you have any further questions or concerns with progression of your request. A joint on-site inspection, with Council’s Overseer Noel Kerr, is to be conducted prior to the commencement of any works associated with the new access. The inspection can be arrangement by contacting Noel on 0427 374 312. 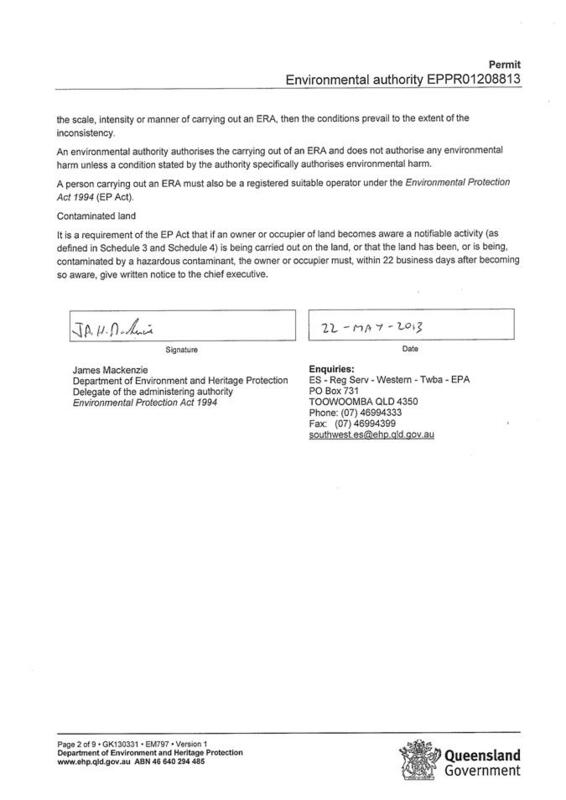 Ian Forbes (Ph: 0427 626 616) has approached Michael about getting a dust seal in front of his residence at 122 Two Mile Road. Michael advised Mr Forbes of our policy and told him that we would investigate and do a report to council. I am writing by way of acknowledgement to your request for a dust seal in front of your property on Two Mile Road, Roma. Thank you for taking the time recently to discuss this matter with Council’s Acting Director – Infrastructure Services, Michael Parker. I understand that he has advised you on Council’s Dust Seal policy and process to formally table your request to Council. I have undertaken an initial review of your request and have allocated this matter to Kylie Fleischfresser – Coordinator Infrastructure Planning, for further investigation. 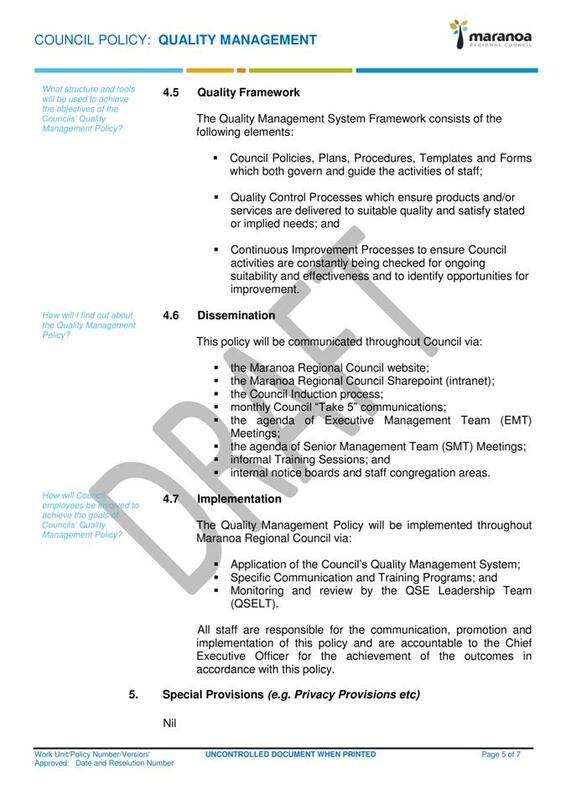 Following this investigation, a report will go to the Council meeting of 13 November 2013 for resolution. Again, thank you for bringing this matter to the attention of Council; I will continue to keep you informed through to finalisation of your request. Please do not hesitate to contact Clara Aitken of my office on (07) 4624 0712, or by email – clara.aitken@maranoa.qld.gov.au, if you have any questions or concerns with progression of this matter. 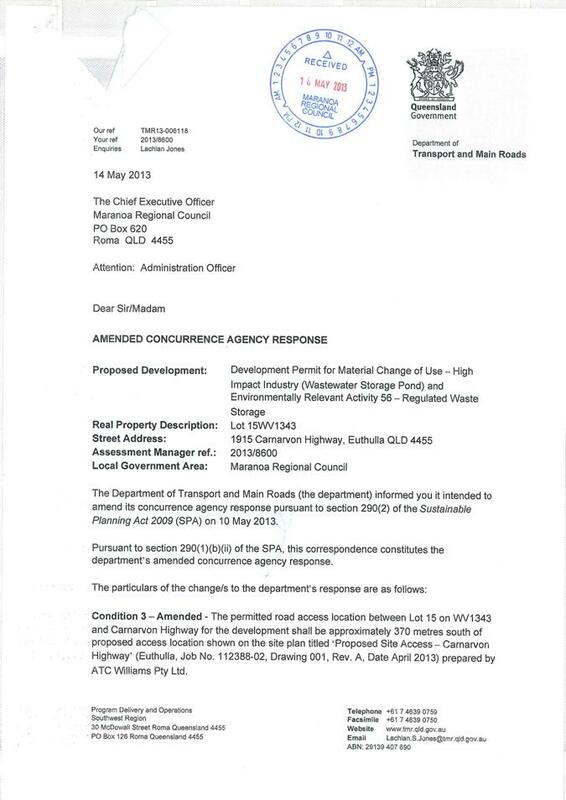 Thank you for your correspondence to Council’s Acting Director – Infrastructure Services, Michael Parker, dated 10 October 2013, in which you request that Council provide gravel pavement to 2.6 kilometres section to Donnybrook Road. I have undertaken an initial review of your concerns raised and have allocated this matter to Kylie Fleischfresser (Coordinator Infrastructure Planning) for further investigation. 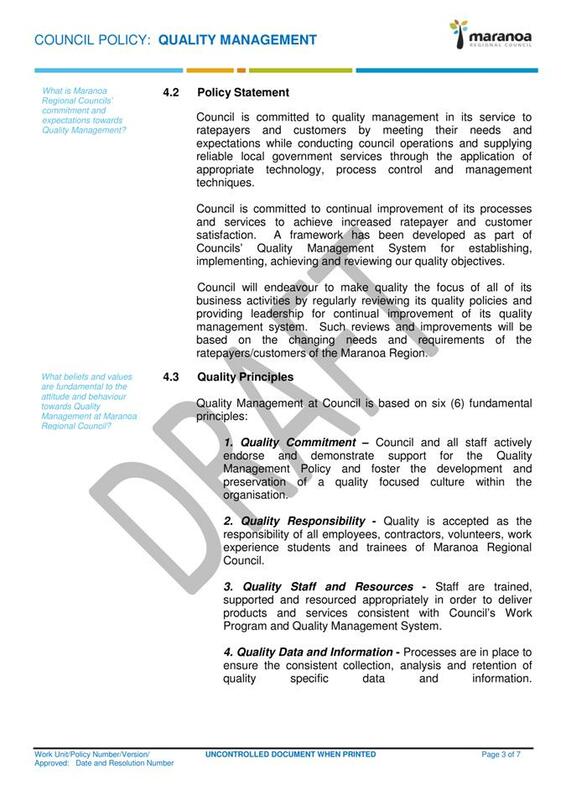 Following this investigation, a report will go to the Council meeting of 13 November 2013 for resolution. Again, thank you for bringing this matter to the attention of Council. 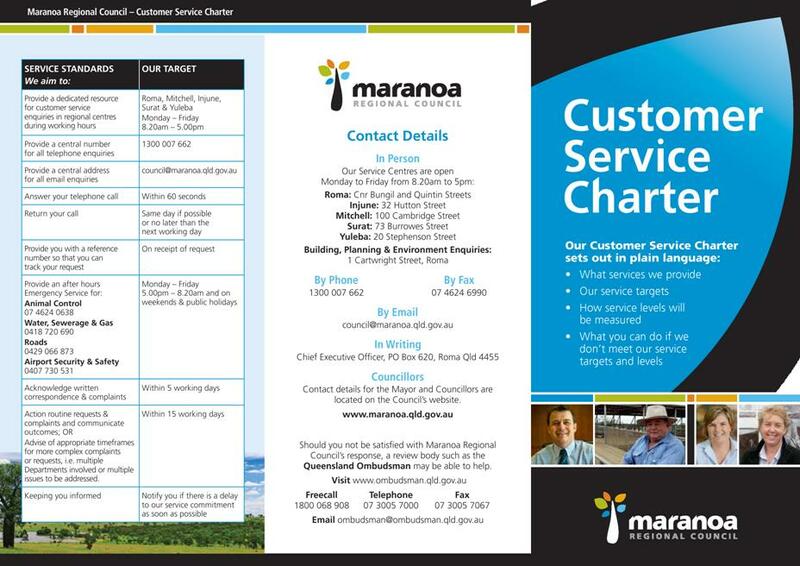 Please do not hesitate to contact Clara Aitken of my office on (07) 4624 0712, or by email – clara.aitken@maranoa.qld.gov.au, if you have any further questions or concerns with progression of your request. 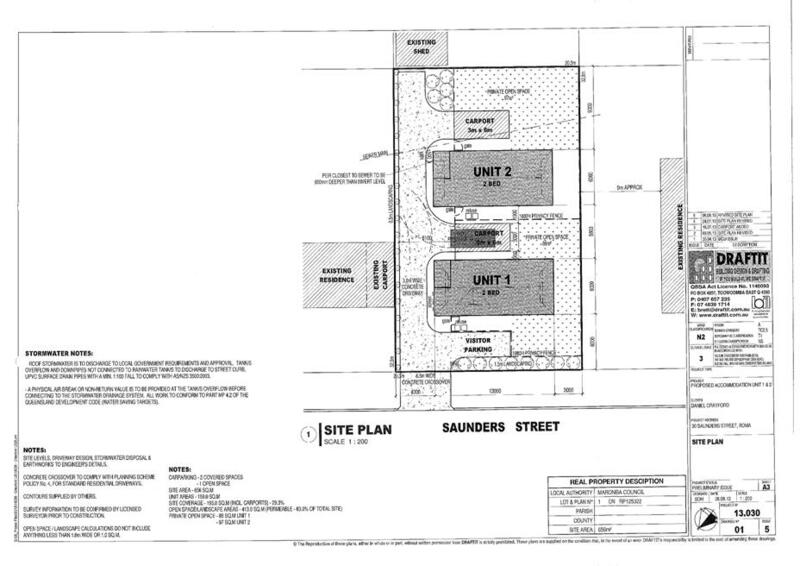 The application seeks approval for a material change of use for “Accommodation Units” (two dwelling units) at 30 Saunders Street, Roma, described as Lot 1 on RP125322. 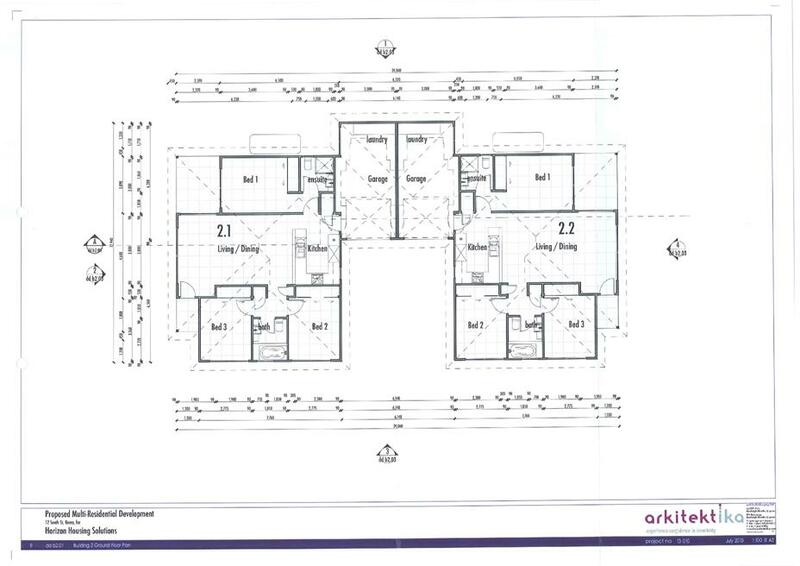 The development comprises two detached units each with two bedrooms and a single bathroom. The development site is located within the Residential Zone and is surrounded by existing residential land uses. The site comprises an area of 656m2 and is currently occupied by an outbuilding. “Accommodation Units” means any premises comprising an integrated development of dwelling units and/r rooming units. The term includes multiple dwelling units, retirement villages and apartment houses. The application is subject to Impact Assessment against the relevant provisions of the planning scheme. Public Notification was carried out from 27 August 2013 to 17 September 2013. No submissions were received during this period. The development proposal does not trigger assessment by any external agencies. The site is situated within a developed urban area and will not result in the removal of any significant vegetation, or impact on environmentally significant areas, including wetlands, habitats, corridors and open spaces. The proposal is for a residential use in a developed urban area. The development will not compromise biodiversity, water or air quality. The proposal is for residential development that is not located in proximity to the Town CBD. The proposed use will not adversely impact on the efficiency, attractions or vitality of the commercial area. The proposal is for residential development within the Residential Zone and will not adversely impact on tourism in the region. The development site is located within an established residential area that provides convenient access to infrastructure and services. The development site is not located in proximity to major water cycle, rail or electricity infrastructure. The development is appropriately located within a residential area and will not adversely impact on the operation of the local road network. The development site is located within an established residential area with infrastructure and services available to provide a suitable living environment for residents of the dwelling units. The development will contribute to the local streetscape by providing housing diversity, whilst remaining sensitive to the rural amenity of the town through a design and use of building materials that are consistent with the scale, siting and character of the local area. Site landscaping and will also contribute to the overall amenity of the development and streetscape. The proposed development will increase the range of housing types available to the community. The proposal is for a residential use within the Residential Zone. The development is consistent with the existing land uses in the locality and will not have an adverse impact on noise levels, traffic volume, lighting levels or the local amenity. 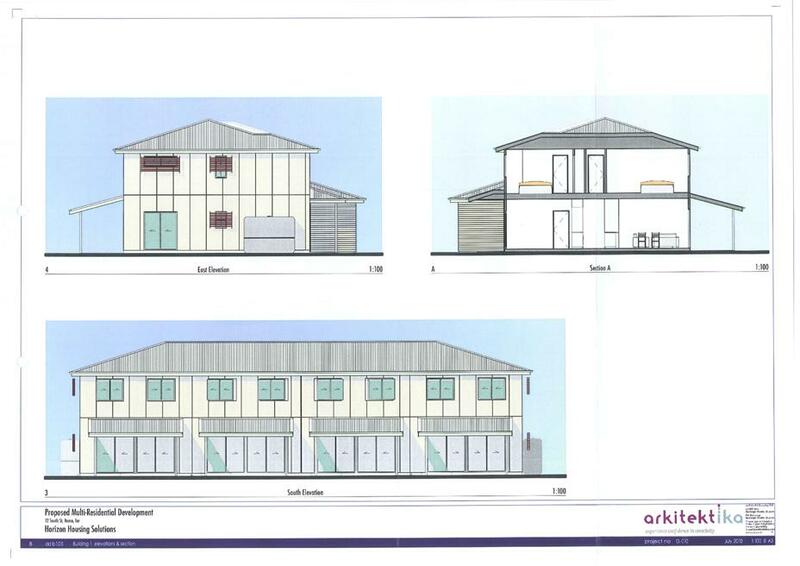 The proposed development will provide residential accommodation which will support a range of activities in Roma. The proposal is for a residential development situated within the Residential Zone. The development does not involve business or commercial activities. The proposed development is limited to a single storey and 4.3 metres in height. 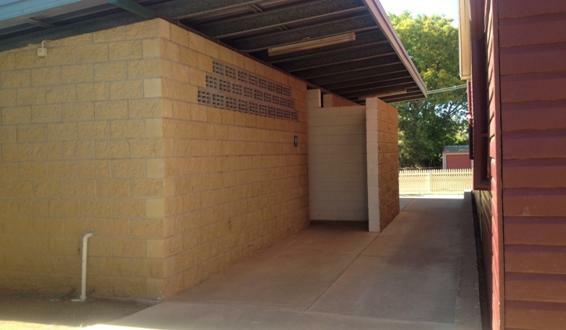 The buildings will be constructed of “Linea” cladding with a pitched roofline and colorbond roof sheeting. The development is consistent with the scale and character of residential land uses in the surrounding area. The development is consistent with the intent of the residential area and will not adversely impact on the safety and convenience of cyclist or pedestrian movements in the locality. Vehicle manoeuvring areas will be provided within the site to ensure vehicles can exit onto the roadway in a forward direction. The development is not located in proximity to rail corridors. Access to the site will be obtained via a local access street which is designed to cater for residential land uses. The development site is located in an established residential area with access to community services. The development will increase housing diversity in Roma Town. The proposed development is located within an established residential area that has access to infrastructure necessary to service the proposed use. The development site is located in an established residential area with efficient and equitable access to social infrastructure. Conditions of approval will require stormwater from the development site to be collected and discharged to ensure no increase in post-development flows to adjoining properties and no contamination or silting of waterways. Access to the site will be obtained via a sealed vehicle crossover to Saunders Street. This will be imposed as a condition of approval. 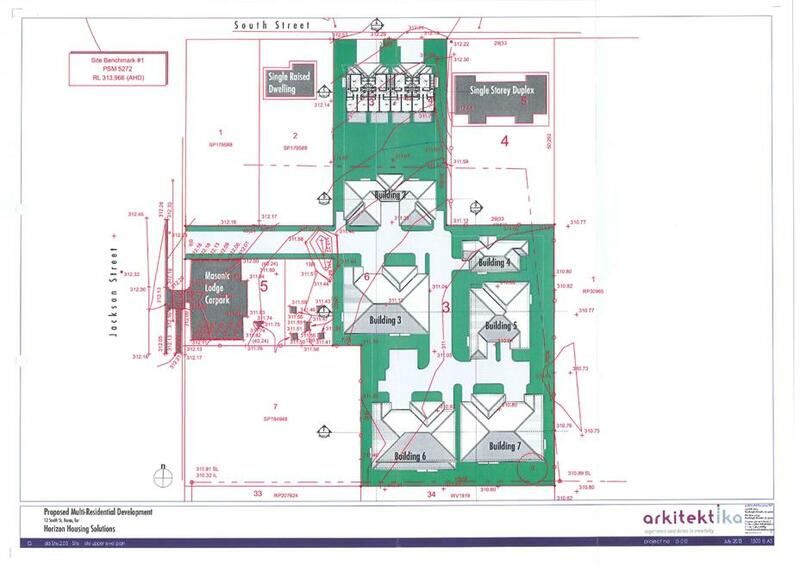 Not Applicable – The proposed development is for Accommodation Units. The development incorporates one undercover car parking space for each unit and a single visitor parking space. A total of three car parking spaces will be provided on the site. Vehicle manoeuvring areas will be provided onsite to allow vehicles to exit onto the roadway in forward direction. All access, car parking and manoeuvring areas will be sealed with an approved impervious surface ensuring all weather access to the existing road network. The development proposal does not involve the creation of new roads. Conditions of approval will require the construction of a sealed vehicle crossover to the roadway. The development site is located on a local access street which is designed to cater for residential land uses. The development is not in proximity to State-controlled roads and will not impact on their function as a link between major centres. The development site is not located on proximity to rail corridors. Not Applicable - The development site is not identified as being subject to a 1 in 100 year flood event. The proposed development is a residential use and is not of a nature to cause environmental harm or nuisance through air emissions. The development is for a residential use that is consistent with the intent of the area within which it is proposed. The development is not anticipated to generate noise levels in excess of what would normally be expected in a residential area. 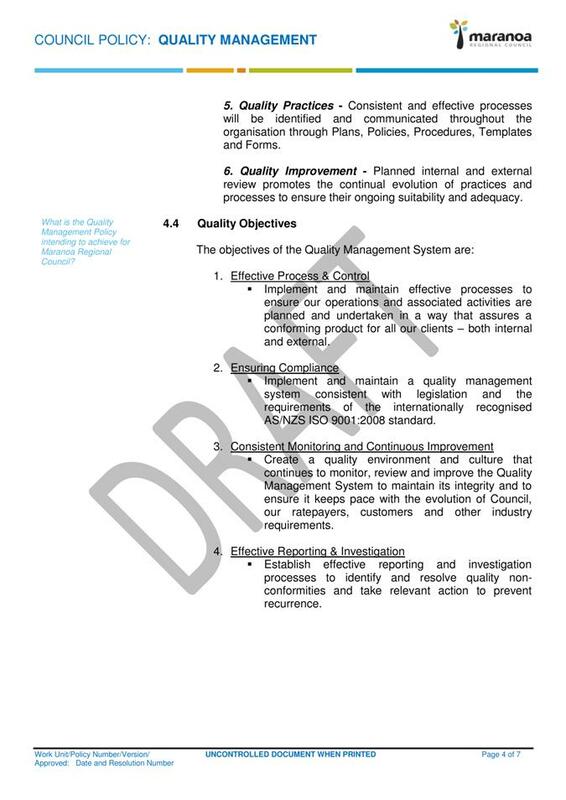 Conditions of approval will require any excavation and filling of the site to be undertaken in accordance with Schedule 7: Standards for Construction Activity and the CMDG Design Guidelines. The proposed development is limited to a single storey and 4.3 metres in height above ground level. The scale of the development is consistent with the character of the surrounding urban area. The building footprint of the units and carports will occupy 195m2 of the site area, equating to approximately 30% site coverage. The development is sensitive to the local character and amenity in this respect. The proposed units will be setback 6 metres from the front boundary, a minimum of 3.0 metres from the side boundaries and 9.0 metres from the rear boundary. 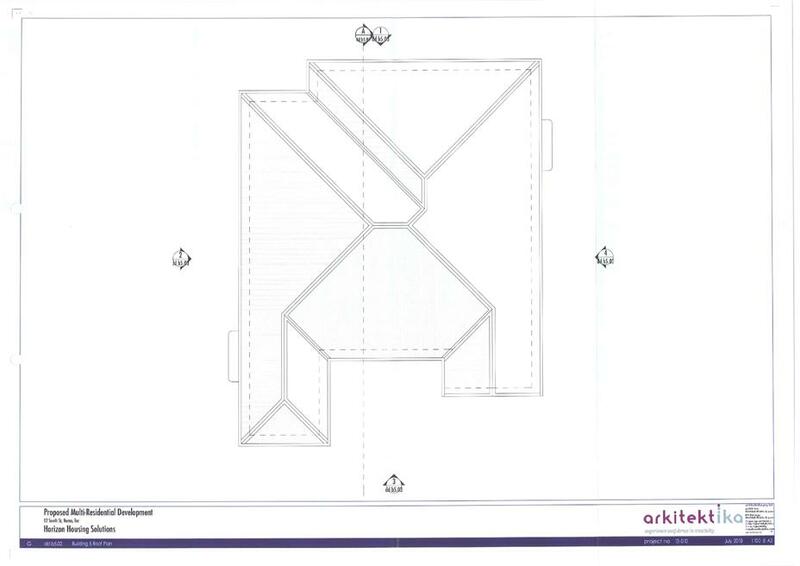 A relaxation of the minimum setback to the front boundary (7.0 metres) is sought to avoid constructing over the existing sewerage main traversing the rear of the site. A 6.0 metre setback to the front boundary is in keeping with existing dwellings in the area and will not comprise local amenity. The proposed units are setback from site boundaries to ensure adequate sunlight, ventilation and open space is provided for residents. Privacy fencing will be established between the units and along the site boundaries to provide private open space for residents of the units. 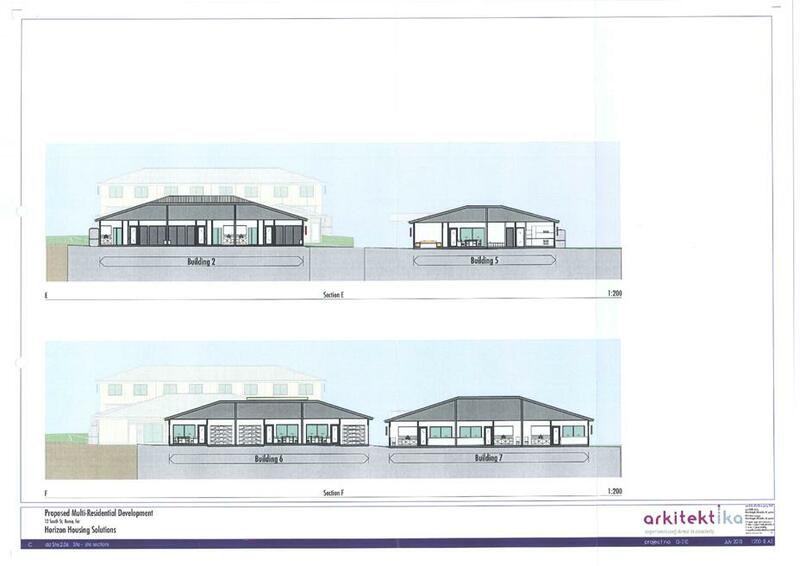 Landscaping will be established to a width of 1.5 metres adjacent the front boundary of the site and 0.5 metres width between the driveway and eastern property boundary. A landscaped area will also be provided adjacent to the vehicle manoeuvring area at the rear of the site. The private open space areas of each unit will be grassed. Site landscaping will contribute to the overall amenity of the development and local streetscape. 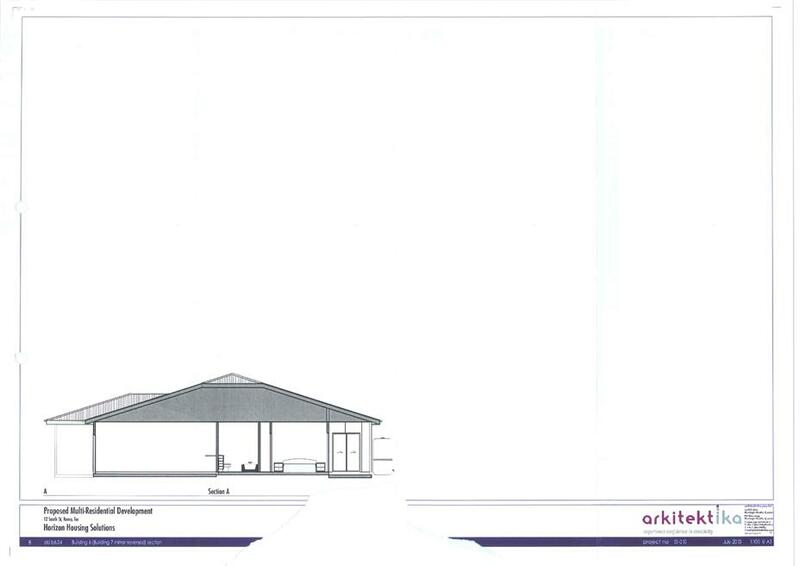 The development includes a single carport to cater for each of the units. 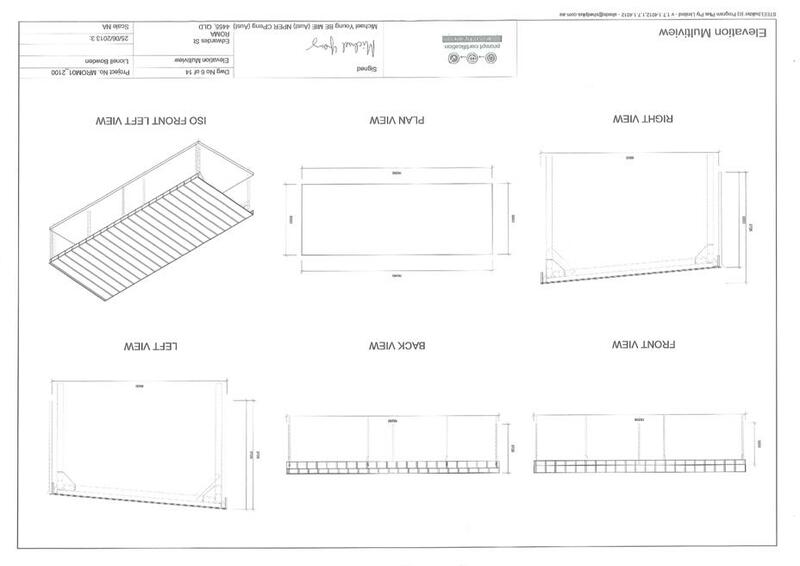 The carports comply with the minimum boundary setbacks and will not be visible from the street frontage. 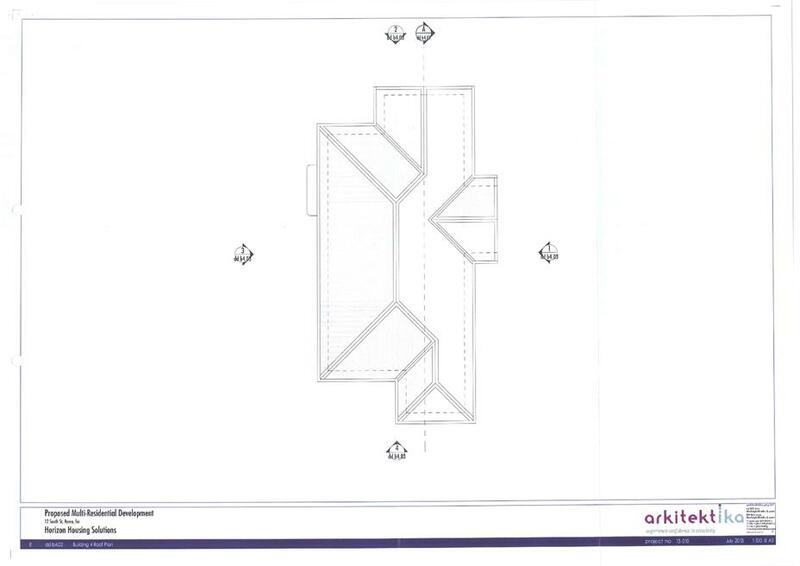 The proposed outbuildings will not adversely impact the residential amenity of the area. Although the proposed development requires assessment against the Impact Assessable provisions of the planning scheme, the proposal does not conflict with the intent of the Residential Zone. 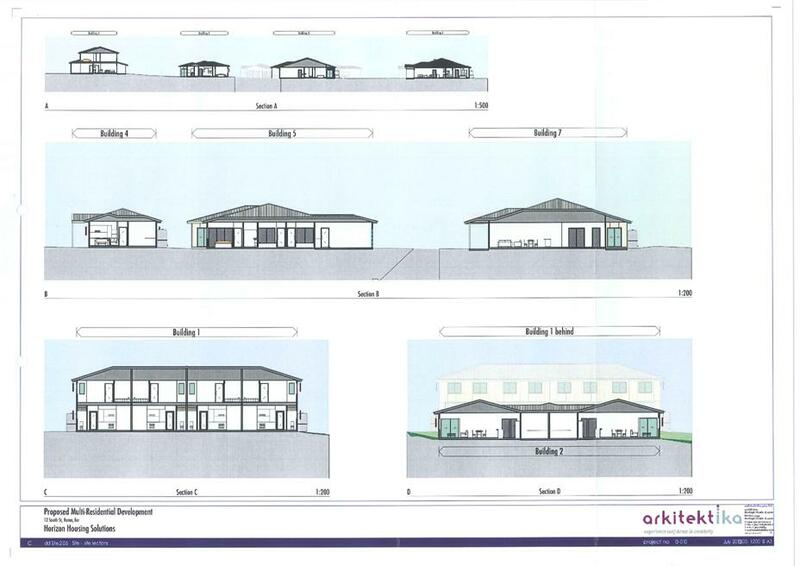 The proposal is consistent with the scale and character of residential development in the local area and will contribute to the range of housing available in Roma Town. 4. 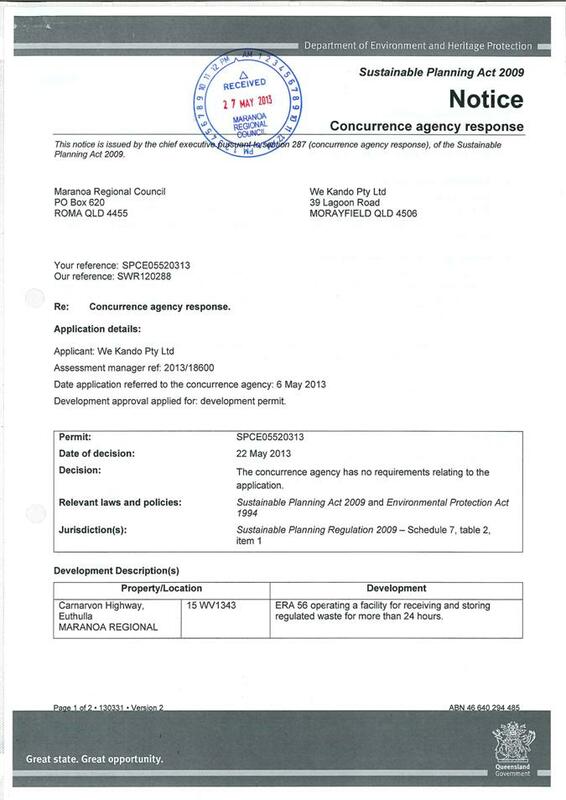 Development Approval 2013/18622 for a Material Change of Use - “Accommodation Units” situated at 30 Saunders Street, Roma Qld 4455, and described as Lot 1 on RP125322. $9,000.00 is payable as infrastructure charges. This is based on an adopted charge of $15,000.00 per 2 bedroom dwelling unit. 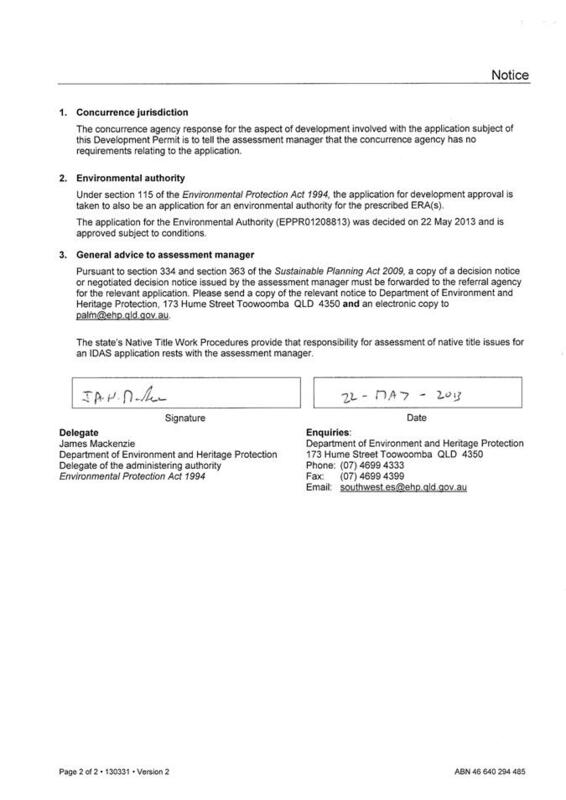 This charge is levied in respect of a Development Approval for a Material Change of Use “Accommodation Units”, situated at 30 Saunders Street, Roma Qld 4455, and described as Lot 1 on RP125322. Prior to construction of the approved development. A permissible change is a minor change to a development approval that would not result in a substantially different development (section 367 of the SPA). An AICN, or negotiated AICN, cannot be issued as part of the process for a permissible change to a development approval. In this regard, a permissible change to a development approval should not result in a change that warrants a new AICN.  § an error in the calculation of the charge. Letter - Roma & District Lapidary and Minerals Society - Construction of a Garden Shed. 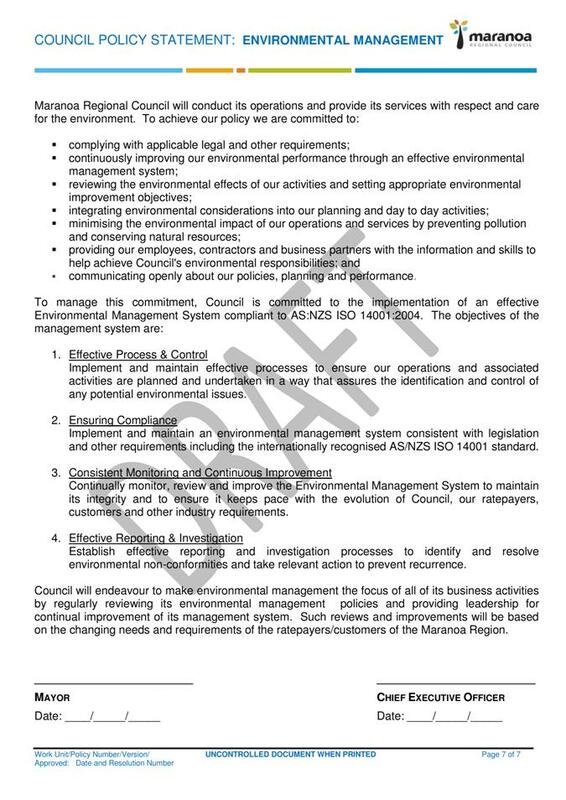 The application seeks approval for a Material Change of Use for “High Impact Industry” - Wastewater Pond and Environmentally Relevant Activity 56 – Regulated Waste Storage on land situated at 1915 Carnarvon Highway, Euthulla. It is expected up to ten deliveries per day with an average daily received volume of up to 263,000 litres. · Effluent received at the site will comprise of 60% untreated and 40% treated. 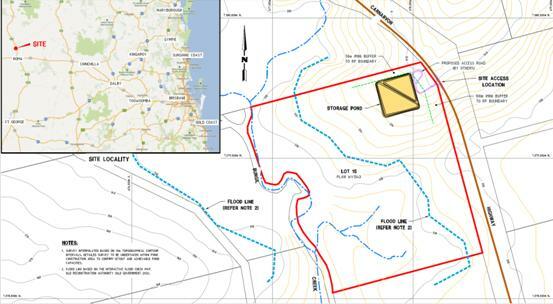 The subject site is situated at 1915 Carnarvon Highway, Euthulla QLD 4455, described as Lot 15 on WV1343. The site is zoned Rural and is primarily used for grazing purposes. (iii) require a licence under the Building (Flammable and Combustible Liquids) Regulation and are within 200 metres of land zoned Urban and Rural Residential. The term includes activities commonly referred to as noxious, hazardous or offensive industries and salvage yards. 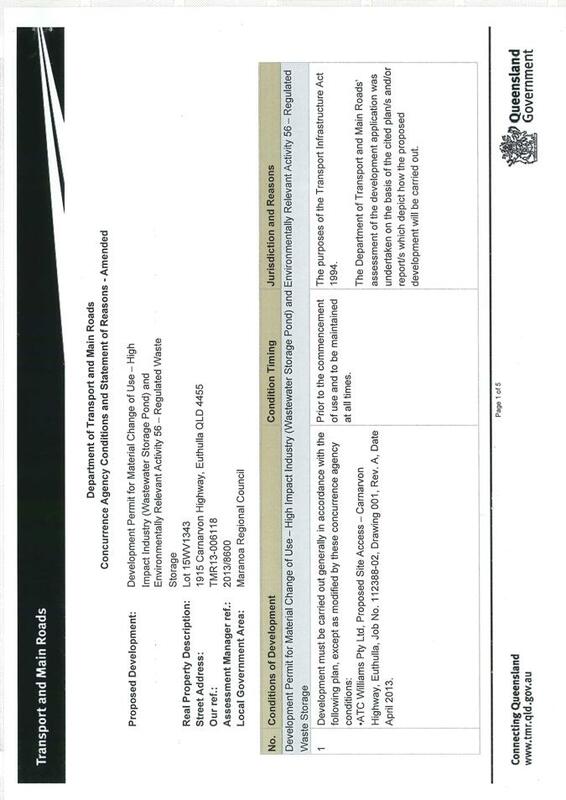 The application is subject to Impact Assessment against the relevant provisions of the Bungil Shire Planning Scheme 2006. Ten submissions were received during the public notification period (11/06/2013 – 03/07/2013). The proposed wastewater pond is not located within the Protected Areas Overlay of the Bungil Shire Planning Scheme. (ii) Ecological sustainability is achieved by maintaining and improving biodiversity, water and air quality. The proposed development will be required to comply with the Environmental Protection Regulations water and air quality. The subject property partly contains Good Quality Agricultural Land on the southern boundary, the wastewater pond will be located on the properties north east boundary which is outside the area mapped as Good Quality Agricultural Land. The site is not identified as being within a Key Resource Area and will not adversely impact on the operation of extractive industries in the region. The proposed waste treatment and resource recovery facility will provide additional employment opportunities for the region during the construction and operational phases. The proposed development will not adversely impact on rural business opportunities. 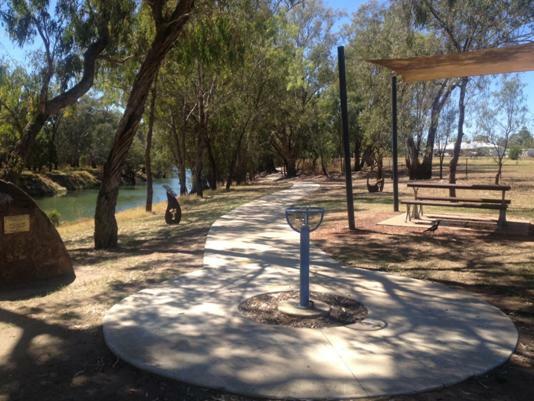 The proposed development will gain access to the existing road network via the Carnarvon Highway. The proposed development will reduce the load on existing sewage treatment plants in the region. The development will not burden the Council infrastructure network, with all services to be provided on-site. (ii) Rural residential and urban residential development occurs in distinct localities that provide a sense of community, amenity, services, and a safe, affordable living environment, whilst maintaining rural amenity. The proposed development is for an industrial use and will not adversely impact on the role or identity of the Injune township as the main centres for residential or business uses within the shire. (iii) Infrastructure networks such as road and rail, water cycle and electricity infrastructure are protected from encroachment by sensitive land uses which may adversely affect or limit the normal operation of that infrastructure. The proposed development will not encroach on established infrastructure networks. DTMR are a Concurrence Agency for the proposed development and have imposed conditions to address the impact of the development on road corridors. 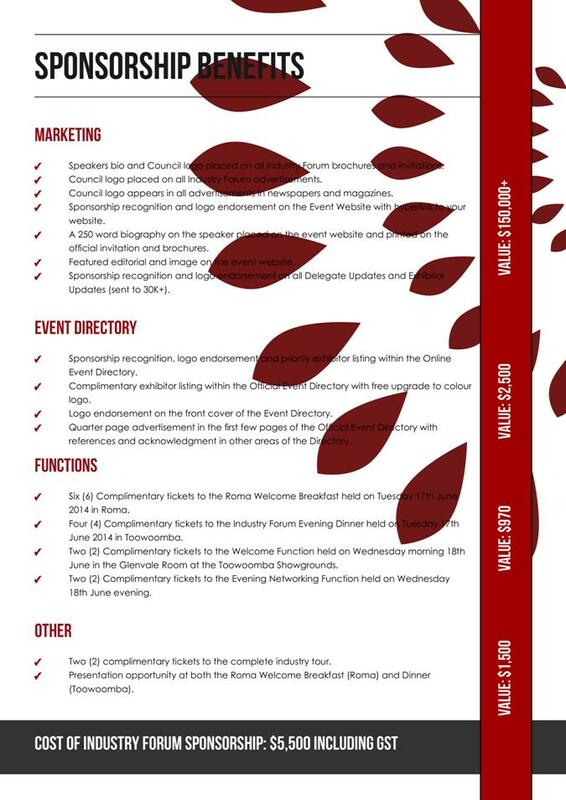 (iv) The role and identity of Injune as the main business and community centre of the shire is consolidated. The proposed development is appropriately located within the Rural Zone, distant from the Injune Township. The development will not prejudice the role and identity of Injune as the main business and community centre within the shire. 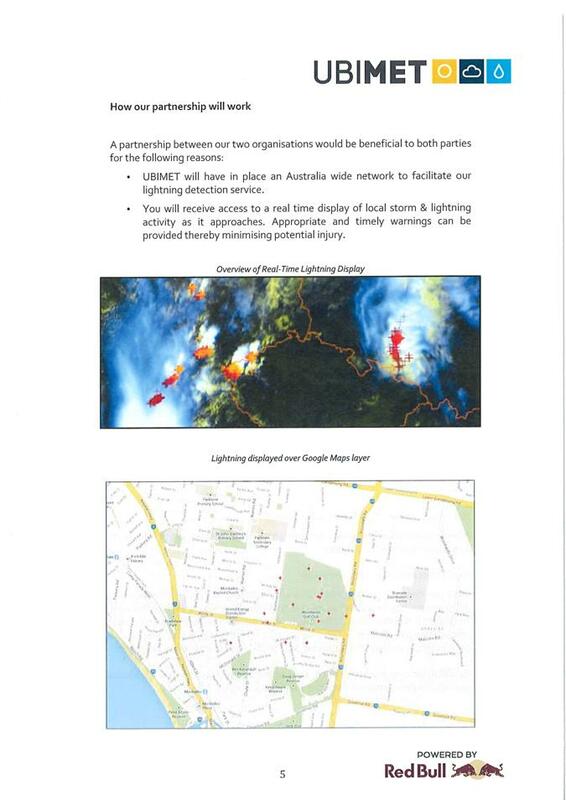 (iv) Adverse effects from natural and other hazards, including bushfires are minimised. 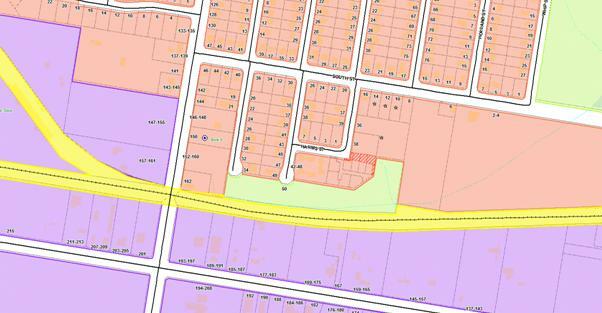 The proposed development has been located to ensure that no part of it is situated within the medium bushfire hazard area mapped on the site. (vi) The range of housing types, services and facilities meets the needs of the community and other uses. The proposed development is for an industrial use that will provide an essential resource for development within the region. 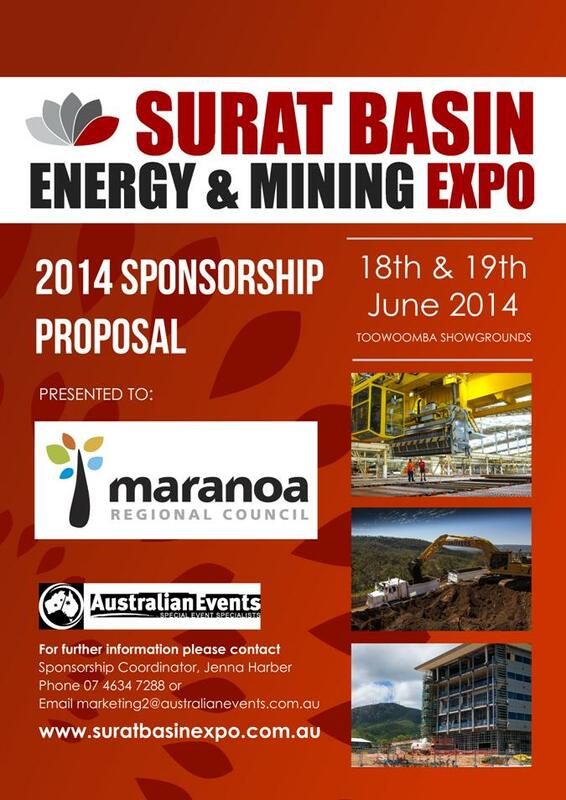 The proposed development reflects the economic potential of the resource industry in the rural area. 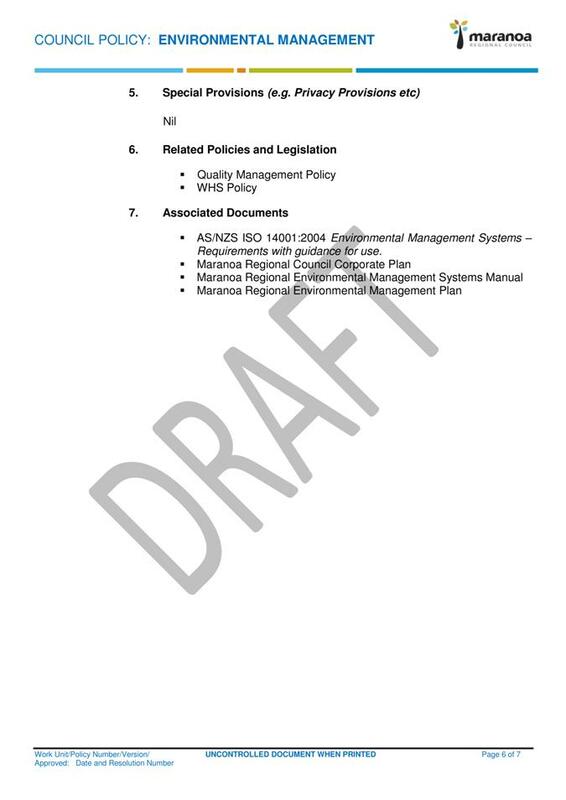 The location of the proposed development in the Rural Zone is considered appropriate due to the area and separation distances required to operate the facility, and lack of suitable and available large remote sites in the Industry Zone for this method of waste disposal. The site is sufficiently buffered from adjoining properties so as not to prejudice future Rural Activities, provided that the use is operated in accordance with the conditions of development. The development will be required to comply with the Environmental Protection Regulation with respect to noise, air quality and odour emissions. 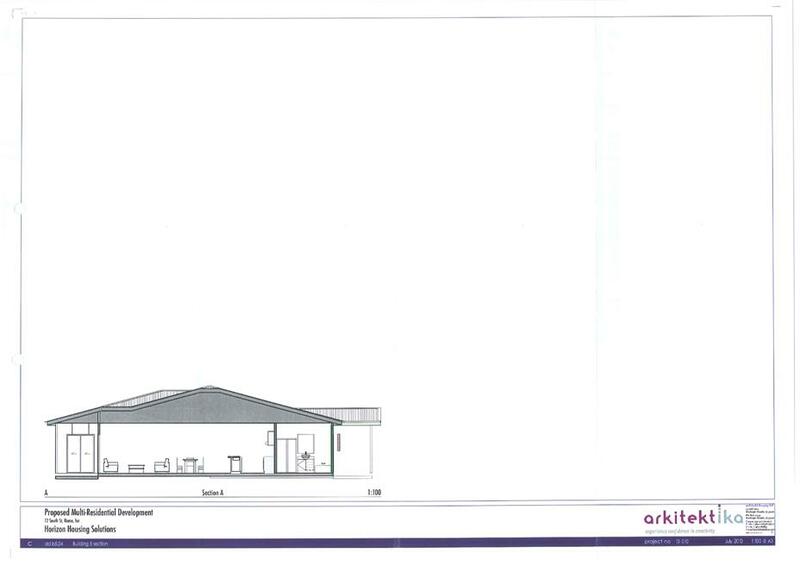 The proposed development is for an industrial use located within a rural area. The development will be confined to designated areas within the site and will allow the existing agricultural activities to continue as the primary land use. The development will not adversely impact on rural amenity. The proposed use will be confined to a small portion of the total site area and will not affect the ability of the site to continue to be used primarily for agricultural purposes. It is considered that subject to the recommended conditions of approval and the DEHP requirements, the proposed development will not prejudice or adversely impact on other uses, including established uses within other Zones. The crossover from the site to the Carnarvon Highway will be upgraded to meet the design requirements of the development. The development has no impact on areas of conservation, cultural or landscape importance. (m) does not impact adversely on infrastructure. The subject site is not connected to infrastructure and is not a major traffic generator. Premises are provided with a supply of electricity and adequate for the activity. The storage pond will be operated by solar power for aeration, the office with also utilise solar power with battery backup. 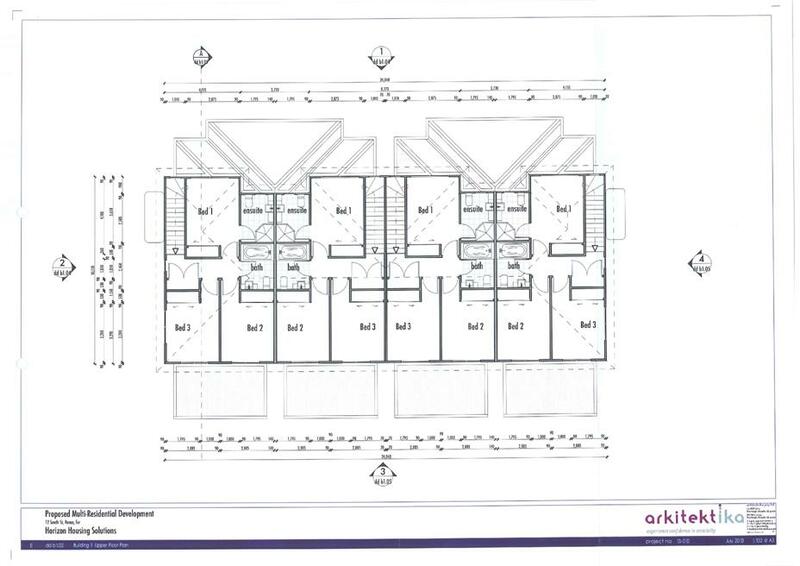 The development will be provided with rainwater tanks with supplementary water carted in to the site when necessary. All wastewater water produced onsite will be collected into a holding tank which will be pumped out into the wastewater storage pond as required. c) protect and maintain environmental values. Stormwater management details for areas outside the ponds will be provided in an operational works development application. Vehicle access is to comply with the development approval conditions and plans. Development must be located where there is convenient access. 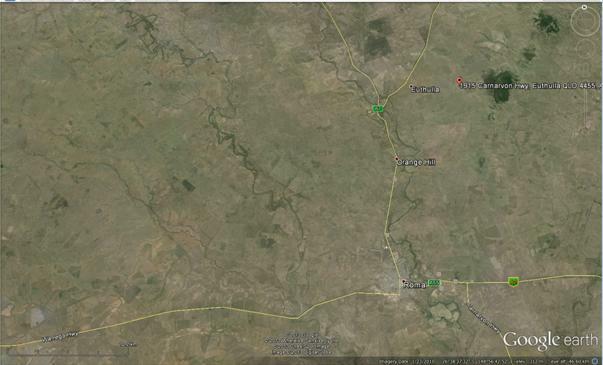 No gas or oil pipelines are located in this area. Premises are located at an appropriate distance from refuse tips or effluent treatment plants to ensure community safety and operation of the uses are not compromised. No rail corridors are located in this area. Site will have a minimum 30 metre buffer from the high bank of any watercourse. Buffer area to be covered by vegetation, including grasses. c) not to have an undesirable impact of the extent and magnitude of flooding. The wastewater storage pond will be maintained in a positive oxidative state to minimise odours. Vortex type aerators will be utilised to minimise production of aerosols. Aeration will cease where winds exceed 30km/hr to minimise any aerosol drift outside of the buffer zone. Nearest dwelling is 1,500 metres from the site on an adjoining property. The proposed development will be required to comply with conditions of approval for the operation of ERA 56, which include measures to minimise air emissions from the proposed use in accordance with Environmental Protection (Air) Policy 2008. The proposed development will be required to comply with conditions of approval for the operation of ERA 56, which include measures to minimise noise emissions from the proposed use in accordance with Environmental Protection (Noise) Policy 2008. Nearest dwelling is at least 1,000 metres from the site on an adjoining property. The facility has been designed so that there is no run-off from water in the storage ponds. water and no release of water from the ponds is permitted. b) soil erosion is kept to a minimum with remedial works. All construction works on site to be undertaken in accordance with the Institute of Engineers (Australia) (IEAUST) Soil Erosion and Sediment Control Engineering Guidelines for Queensland Construction sites. 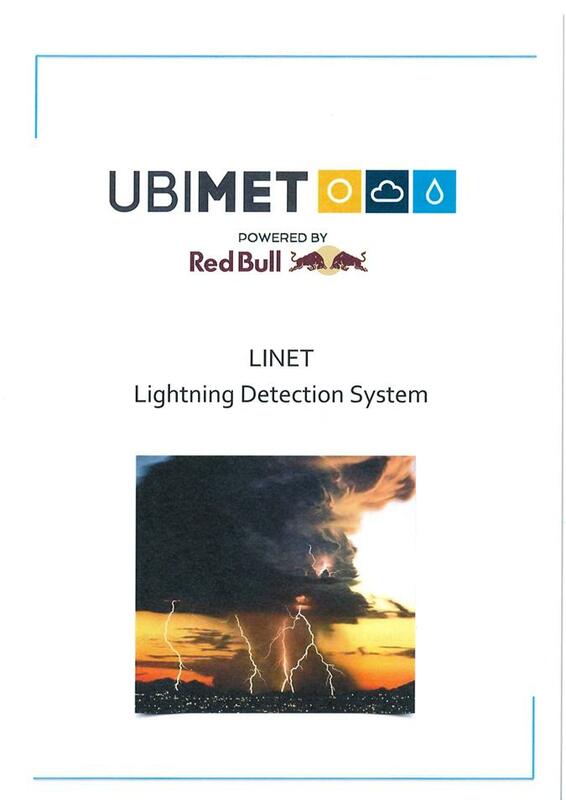 Details will be provided in an operational works development application. d) conflict arising from incompatible uses is minimised. There is no specified separation distance. The proposed development will be required to comply with conditions of approval for the operation of ERA 56, which include measures to minimise noise and air emissions from the proposed use in accordance with Environmental Protection (Noise) Policy 2008 and Environmental Protection (Air) Policy 2008.
c) does not restrict future operational demands of the airport. - transient intrusions into the airport’s operational space. Good Quality Agricultural Land areas as identified in Map R2 – Good Quality Agricultural Land are conserved and managed for the longer term and protected from development that may lead to its alienation or diminished productivity. Areas identified as good quality agricultural land are not used for the facility. d) establishment of open space corridors and networks. There will be no clearing of vegetation outside the development site. Screening vegetation will be planted around the facility. b) safety of persons and property is not compromised. The development has been located on a site where landslip erosion is not likely. b) the provision of firebreaks to ensure adequate setbacks between buildings structure and hazardous vegetation. The development site does contain areas identified as a bushfire hazard. The architectural merit and precinct value of cultural heritage items listed in Schedule 10 is maintained. The development does not contain and is not located in proximity to buildings identified as being of architectural merit or cultural heritage significance. The site does not contain nor is it located in close proximity to known places of indigenous and/or cultural heritage value. Development adjacent to buildings identified as heritage or character buildings incorporates design features, materials and details that blend with the existing character. The development is not adjacent to buildings identified as heritage or character buildings. Rural amenity is to be maintained. 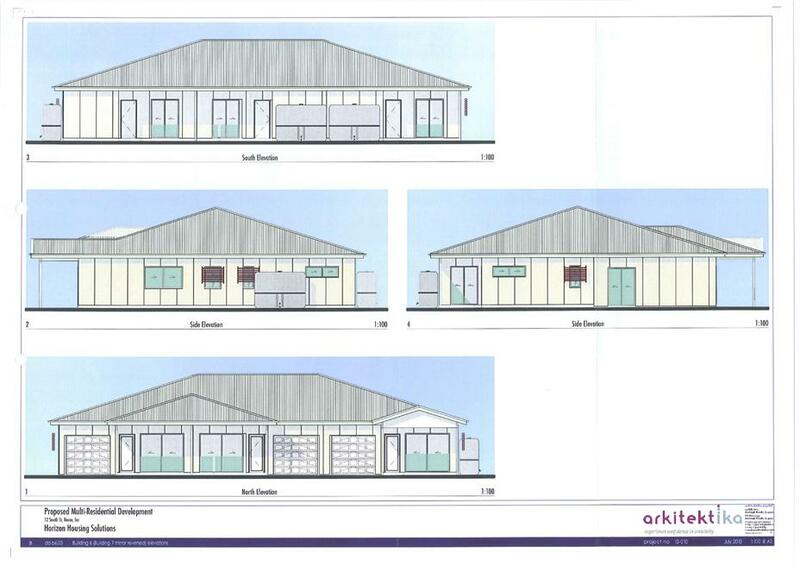 The proposed development does not include residential outbuildings. Adequate buffers are provided to protect rural residential uses from agricultural, transport and industrial activities whilst also ensuring the integrity and viability of such uses. The proposed development is appropriately separated from residential and sensitive land uses and will not harm the integrity and viability of such uses. The dams are to be constructed on the highest point on the subject lot. Upstream from the dams is the highway cutting which will limit overland flow from across the highway. Bunds around the dams will prevent this runoff entering dam. The 5 hectares dams area at 1 metre depth has capacity for 48 megalitres. The proposed incoming volume is 263,000 litres per day giving an increase in depth across 50,000m² of 5.26 mm per day. Mean annual rainfall is 593.6mm. Mean daily evaporation (6.9mm) – mean daily rainfall (1.6mm) = net evaporation per day of 5.3 mm per day. This will ensure the dam does not overflow. Seasonal conditions may limit intake to ensure dam remains less than 1.0m deep. 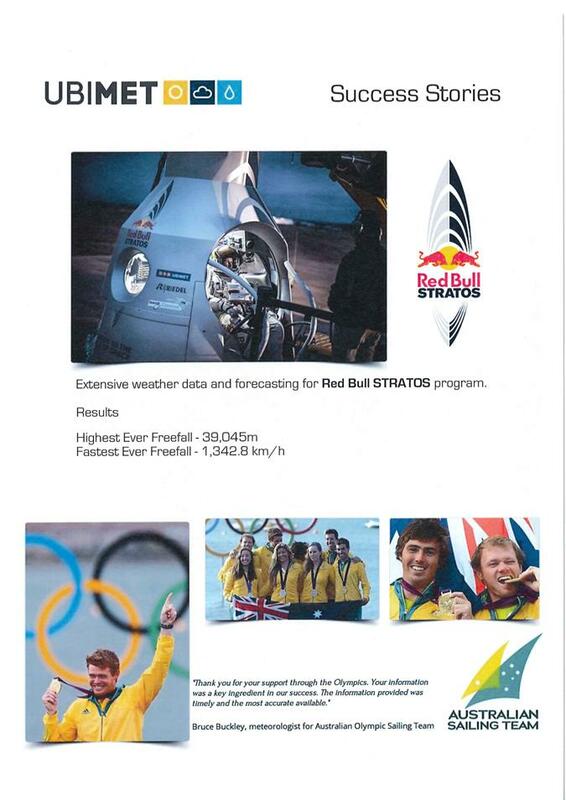 The dams have 500 mm freeboard as a buffer in case of waves or extreme weather conditions. The top of dam bank of Pond B has RL (height above Australian sea level) of 337.9 metres. Bungil Creek channel has RL of 329.0 metres. Bungil Creek flood level as shown on Queensland Flood Reconstruction Maps prepared after 2012 flood is shown as RL 330 to 332 metres. This means the dam is not considered flood threatened. 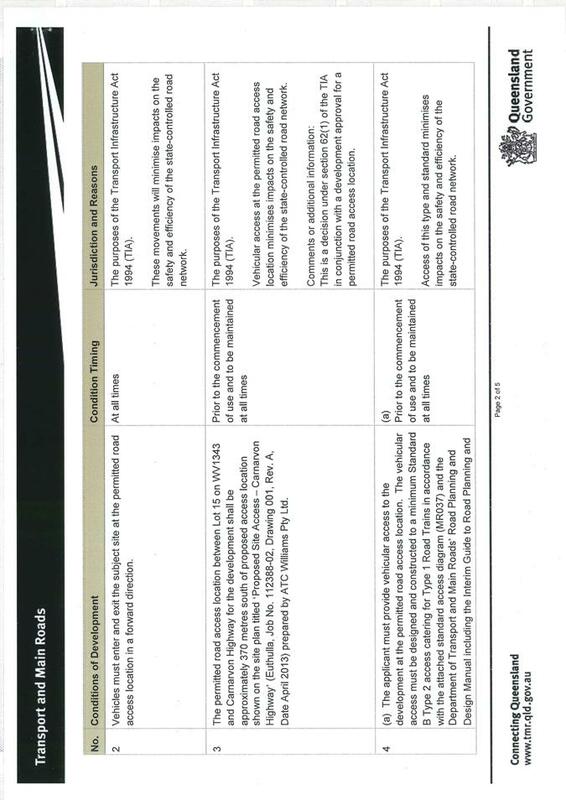 The Hazard Table from Department of Environment and Heritage Protection gives this a low hazard in a “failure to contain scenario”. The effluent will consist of sewage sludge and residues from wastewater and sewage holding tanks, untreated and treated wastewater from wastewater treatment systems and including nightsoil and septic tank sludge. Contaminants are identified as nitrogen and phosphorus. All wastewater is trackable waste and handled and recorded in accordance with Department of Environment and Heritage Protection Waste Tracking Requirements. This ensures it comes from specified sources and does not contain other contaminants. 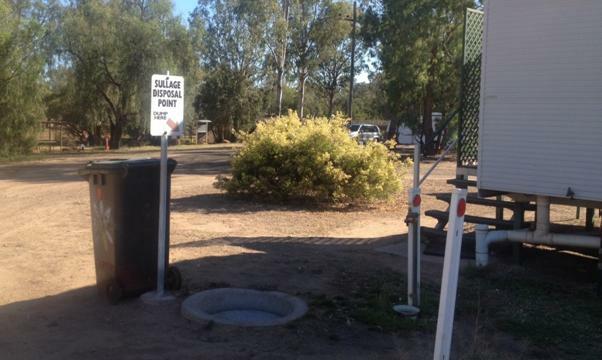 Fences can be constructed around site to prevent native animals entering dam. Water birds will not be feeding from this dam as it will not contain any fish or matter that native animals would eat. Any effluent would have been macerated to a free flowing fluid to allow it to be pumped into and out of tanks on trucks. Birds may land on the dam. This is not controlled. A geotechnical assessment has been provided certified by a Registered Engineer of Queensland. 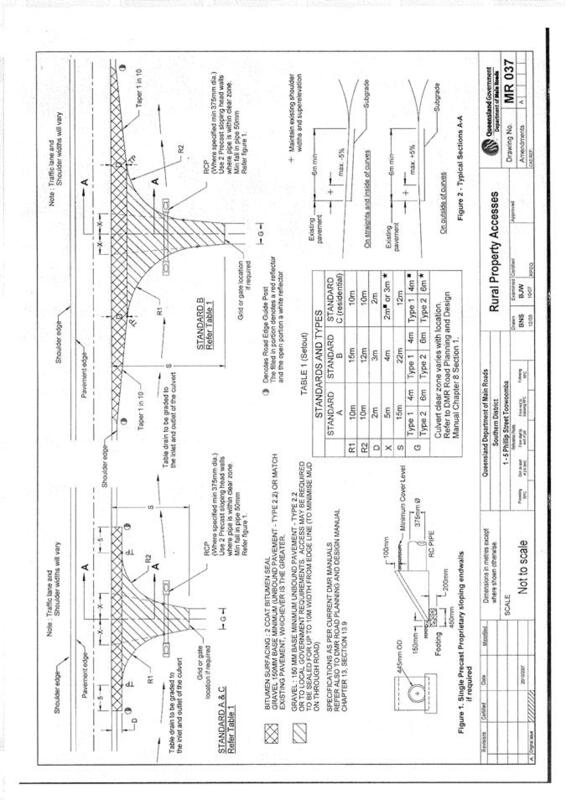 The report states that the clay can be used in the embankment construction but needs to have a cover layer of other soil type over it to prevent shrink-swell movement (cracking). The nearest dwelling is located over 1 kilometre from the dams. 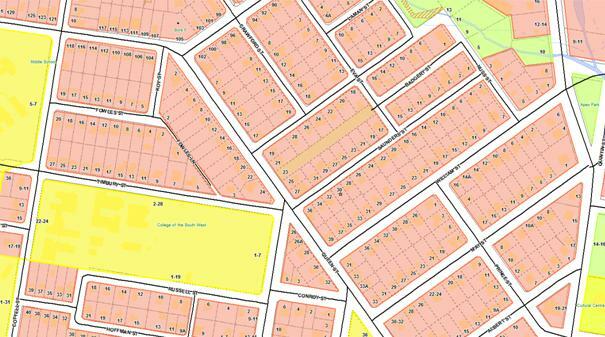 There is no requirement for a specified buffer width in the Bungil Planning Scheme. 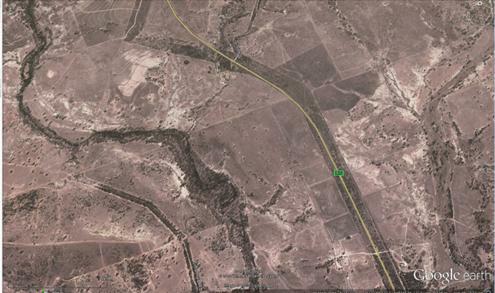 Noise will come from vehicles enter the site but this is less than noise generated by use of the Carnarvon Highway. Operating hours will be 6am to 6pm. Dam has been designed with up to 10 years of sludge accumulation without compromising storage capability. When necessary, pond will be drained, sludge dried and taken to licensed landfill site. Transport of trackable wastes and the designs of the vehicles used are matters regulated by the Department of Environment and Heritage Protection and the Department of Transport and Main Roads. 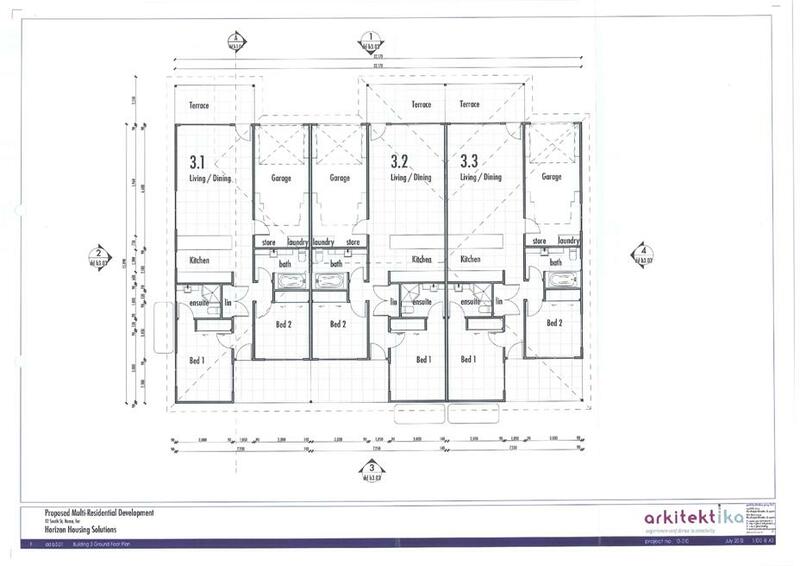 Site office and 2 car parks provided for staff on site. The site will be have staff present during business hours and locked outside of business hours. This site is not on Bungil Creek and has a buffer to the nearest waterways. 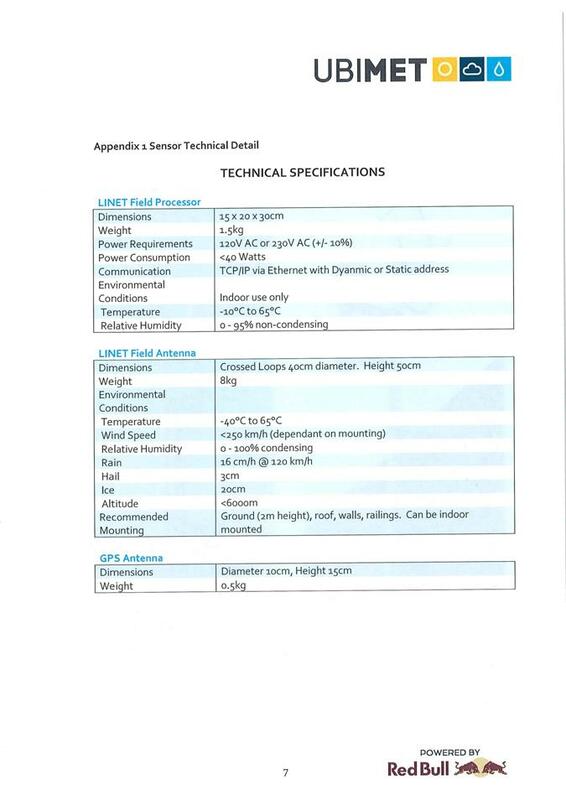 A geotechnical report was submitted to show soil type is suitable for this use. Earthquakes have not been specifically referenced but a Hazard Assessment Table has been provided in accordance with Department of Environment and Heritage Protection requirements for the hydraulic performance of dams. The facility has a low hazard rating. Experience from the Chinchilla site has shown that odours are controlled within 24 hours of receipt of wastewater. High levels of aeration and low aerosol production restricts odours. Dams will be aerated by solar powered floating aerators to maintain adequate dissolved oxygen levels. This inhibits anaerobic bacteria growth. Anaerobic bacteria produce the ndesirable odours. No odours are found beyond Chinchilla site boundaries. Wastewater effluent from bathrooms, toilets, washing machines and kitchens is not considered toxic waste. Most of the matter is biodegradable with the detergents, soaps and washing powders used making up the least biodegradable substances. The geotechnical report from a Registered Engineer of Queensland states that the travel time for the moisture from the pond to the groundwater surface will be some 30 years. Maximum seepage loss is given as 0.01% of pond contents daily (0.1 mm per day decrease in depth). Groundwater was assumed at 10m below existing ground level. The development conditions imposed by Department of Environment and Heritage Protection require routine groundwater monitoring. Noise will be generated by approximately 10 trucks per day entering and exiting the site. A Department of Transport and Main Roads’ survey shows an average of 506 heavy vehicles per day using the Roma-Injune section of the Carnarvon Highway. Site movements are considered minor compared to the noise generated from the Carnarvon Highway which is closer to the dwelling. 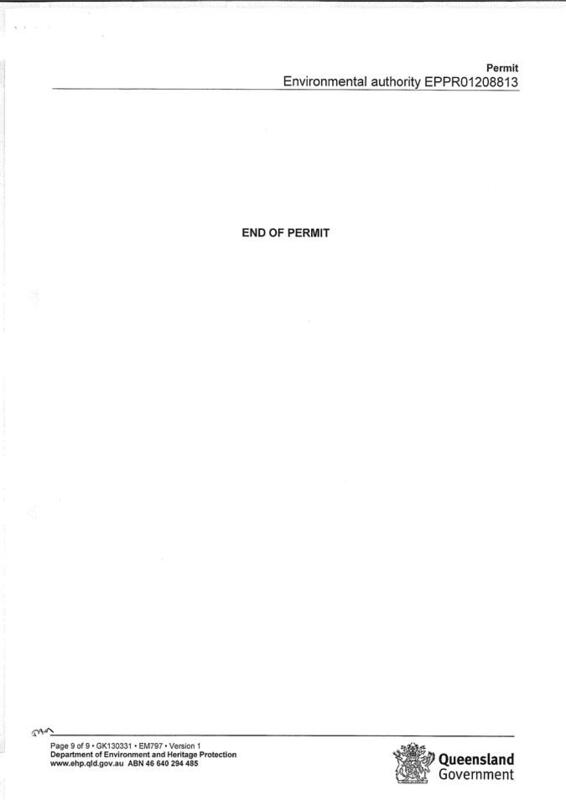 Once a development permit is issued, this is current for life of the operation as set out in the report. We Kando expect the operation to continue for as long as the operation is viable with effluent coming from mining worker’s accommodation in the gas fields. At the end of life, sludge will be removed to licensed landfill and the dam banks will be dozed in and the site leveled, then re-grassed ready for grazing or other rural uses. The facility is licensed to receive K130 Class waste. 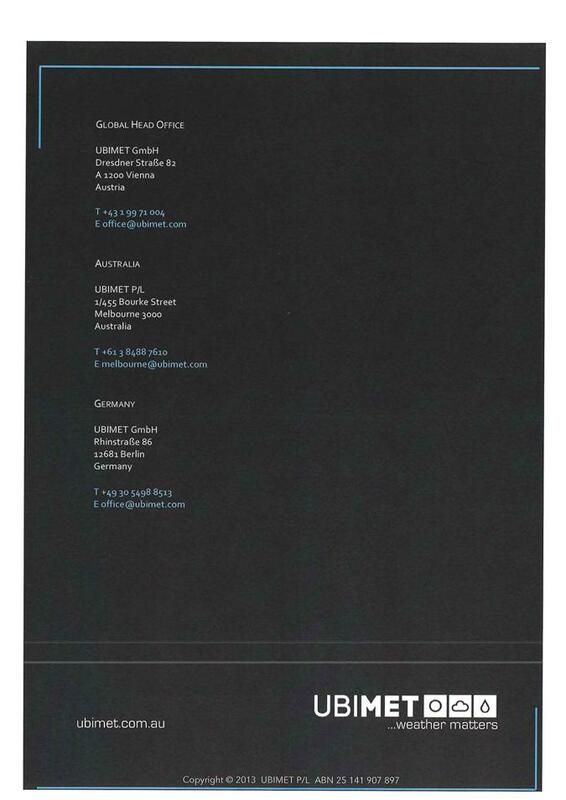 This is listed as blackwater and greywater. This wastewater comes from toilets, bath, basin, kitchen, laundry and shower. No other types of wastes are included on the licence issued from the Department of Environment and Heritage Protection. The wastewater is trackable and handled and recorded in accordance with Department of Environment and Heritage Protection waste tracking requirements. Possible maximum wave height has been calculated as 160 mm. Levels will be controlled with amount of wastewater to be received. A maximum receiving amount of 263,000 litres per day has been specified to allow mean evaporation to exceed amount received. Pond A has capacity for 20 megalitres and Pond B has capacity for 30 megalitres. Ponds will cover an area of 5 hectares and have a nominal depth of 1.0 metre at capacity. Freeboard will be a minimum of 500 mm. Dam banks will have a slope of 1:4. 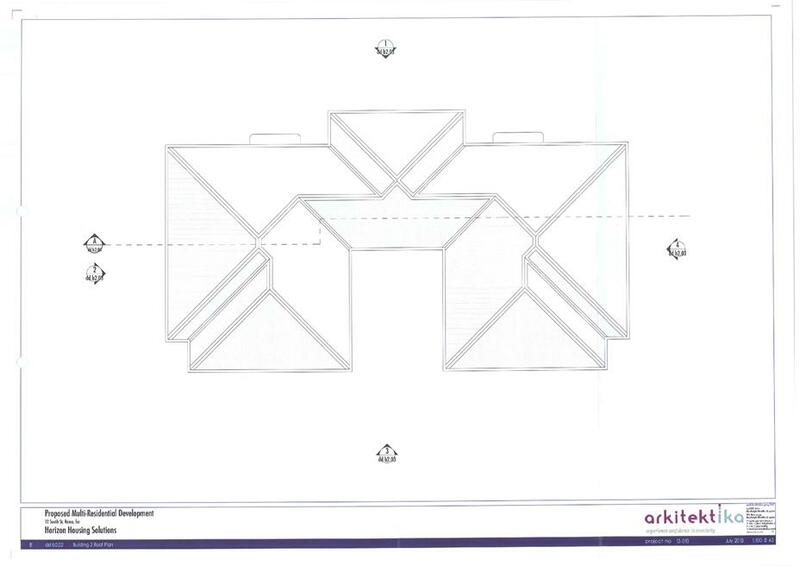 The base profile will be excavated to a nominal depth of 0.7 metre to allow for topsoil stripping and borrow excavation for embankment earthworks. 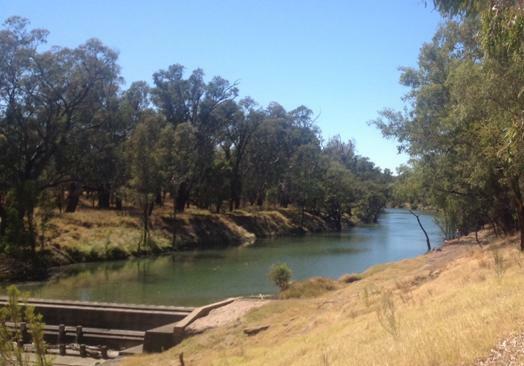 A 3.0 metre wide stormwater drain will direct overland flow around northern and eastern sides of the dams. RL on top of southeastern bank is 338.9 metres. Maximum depth of Pond B can be 2.1 metres at the SW corner. Maximum depth of Pond A can be 1.8 metres at the NW corner. Ponds will be unlined and open to allow for evaporation. 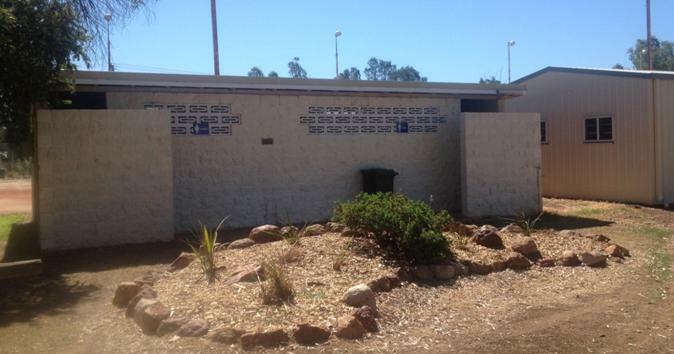 Safe access onto the Carnarvon Highway is controlled by conditions imposed by Department of Transport and Main Roads. 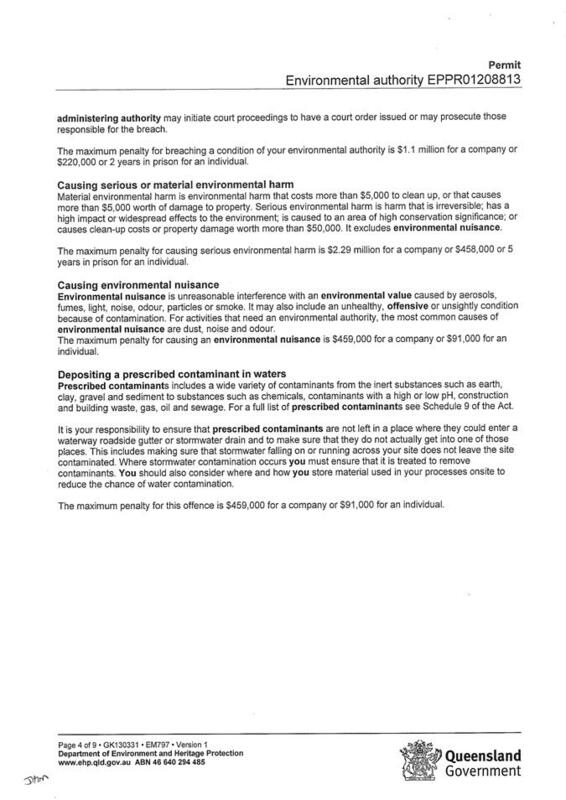 A groundwater monitoring plan is required. Six monthly reports shall be completed. 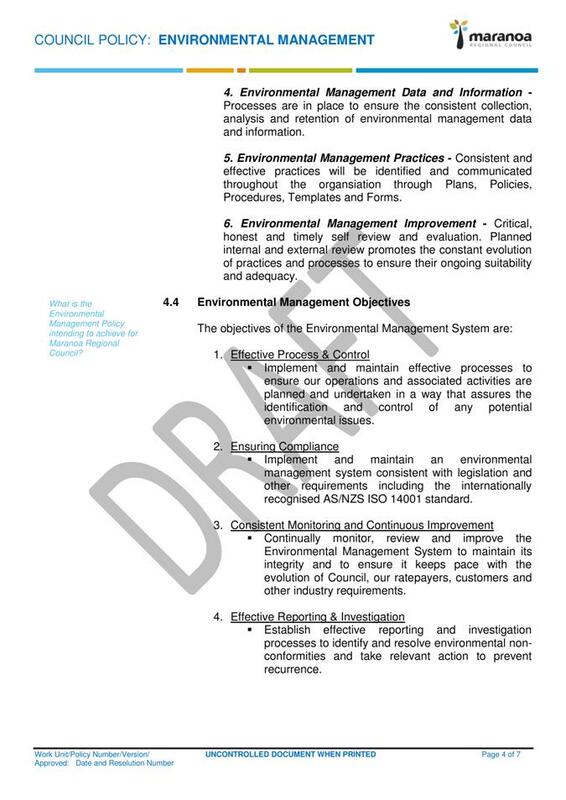 Any potential for environmental harm found in these reports will be notified to the Department of Environment and Heritage Protection and other administering authorities. 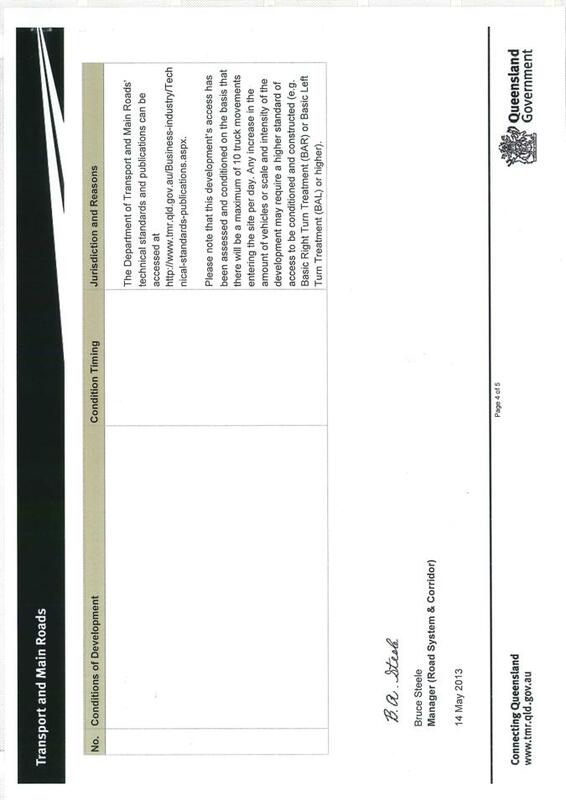 This is a private company applying to develop a site on land they are purchasing. 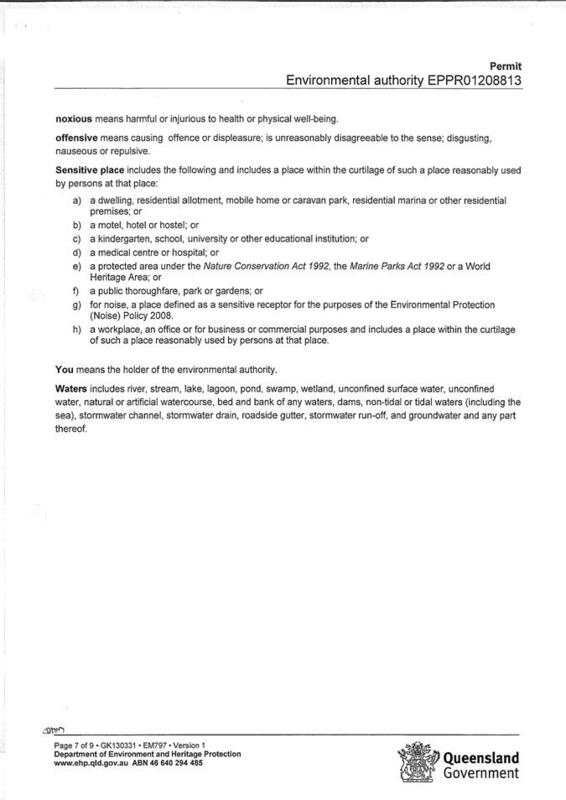 These are commercial arrangements which include the consideration of mining camp locations. 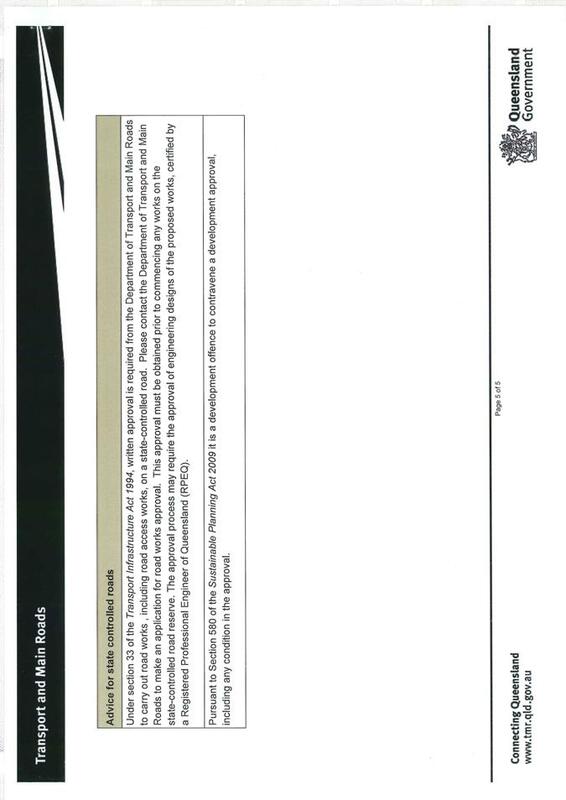 The planning report states there will be 10 deliveries per day. Department of Transport and Main Roads conditions require the access to be constructed for Type 1 road trains. We Kando is purchasing the land so the responsibility for remediation will remain with the company. If the company goes into receivership, it is assumed the land will be sold “as is” and a new owner will decide what they will use the land for. The development permit will remain with the land until the permitted use ceases. 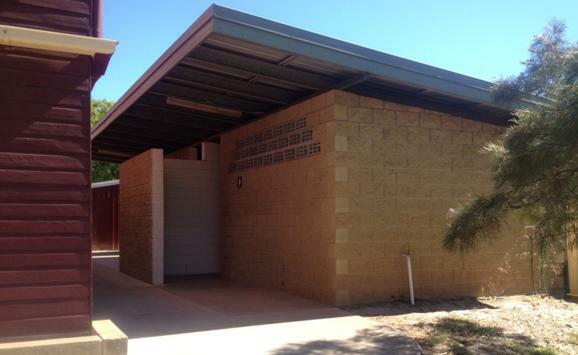 The Council is requiring a bond to cover remediation costs in the future if the company goes into receivership. The increase or decrease in land value is the commercial risk for We Kando. State Government legislation requires a sign is to be displayed on the boundary of the site. 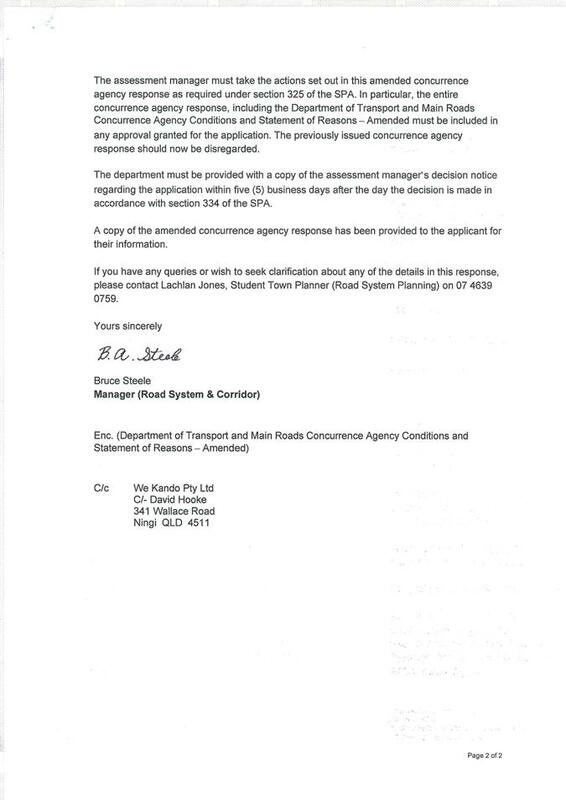 A notice was also placed in the Western Star on 11 June 2013. The developer was also required to give notice to the owners of adjoining properties. 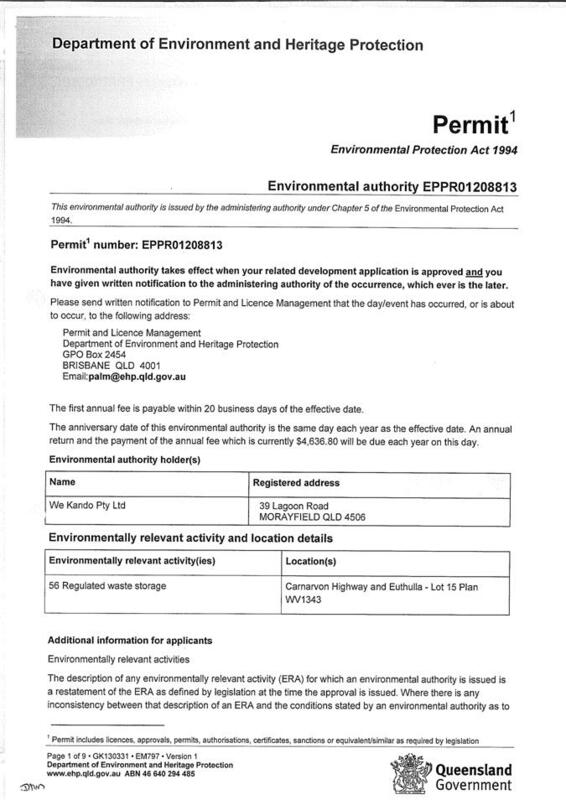 The development application was subject to impact assessment. This gave any interested parties the right to make a submission and to appeal any decision. 10 submissions were received. 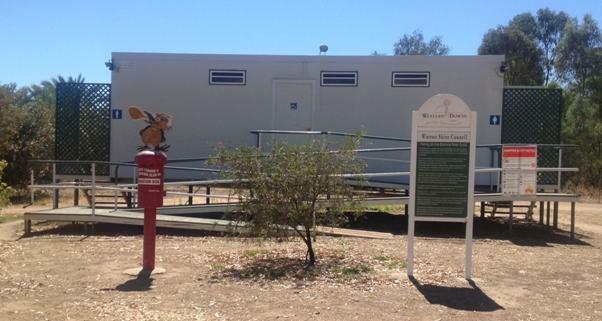 Council officers visited a similar facility near Chinchilla to examine its operations. Lou Scarpato of Lou Scarpato Futureproof Strategies, an independent town planning consultant, was asked to provide his opinion on the development proposal. 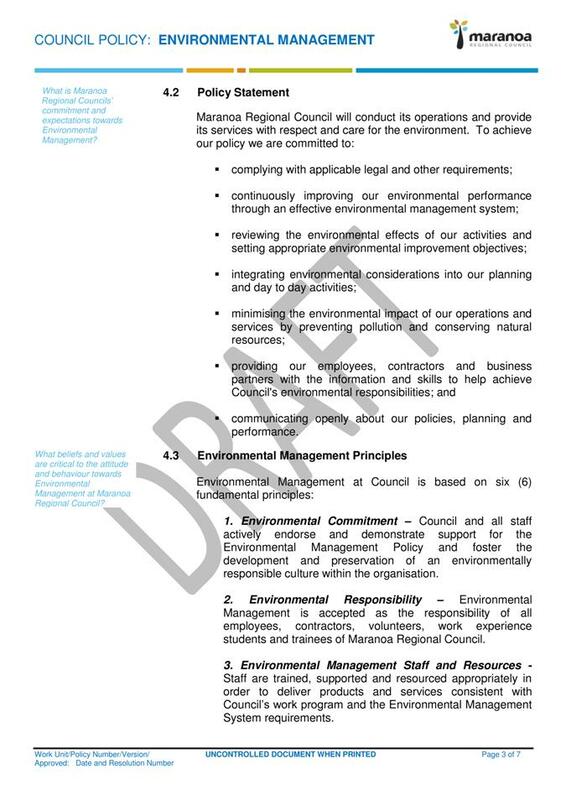 Because the environmental management of waste water storage facilities is controlled by an environmental authority which is approved by the Department of Environment and Heritage Protection, the Council should not refuse a development application on any grounds which are within the scope of the environmental authority. If Council were to refuse a development application on grounds associated with the environmental management of waste water storage facilities approved by that Department, it would need to defend its refusal against both the applicant and the Department in the event of an appeal. The other types of impacts (mainly transport, surrounding land uses, future use of site) appear reasonable and can be addressed by appropriate development conditions. The facility is intended to process black and grey water from workers camps and similar places. 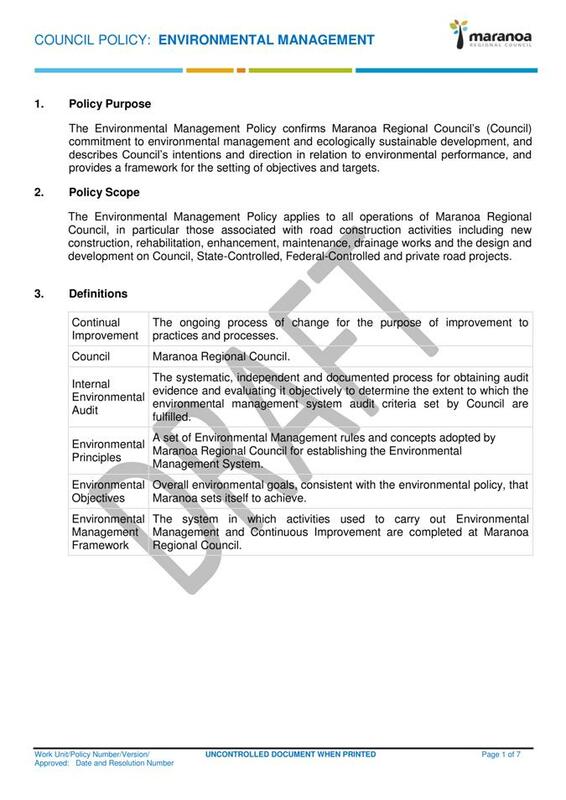 The proposed method of waste water disposal is not a preferred method of disposal for waste water in the Maranoa Regional Council area. It is a very low cost method with minimal treatment of the waste. It effectively relies on long-term evaporation of the waste water to leave behind an accumulating layer of sludge which eventually needs to be removed and taken to a landfill site. 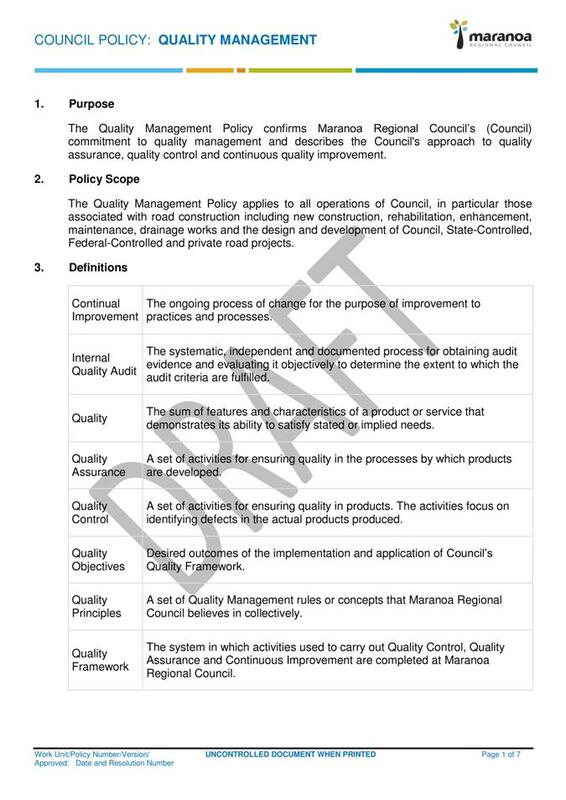 Other waste water treatment systems approved for the Maranoa Regional Council area are based on the waste water being processed to remove the suspended material and make the water fit for other purposes. When there are un-authorised contaminants in the waste water stream, the other waste water treatment systems are oftenadversely affected and this provides an inbuilt incentive (or requirement) to ensure the waste water does not contain unauthorised contaminants. If un-authorised toxic contaminants do enter the evaporation ponds in the proposed system, the material will contaminate the whole pond. The waste water treatment process is controlled by an environmental authority issued by the Department of Environment and Heritage Protection. The Queensland Government has recently written to Queensland local governments, including Maranoa Regional Council, advising against duplication of development controls in development approvals. This is consistent with the approach already taken by the Council where a development includes an Environmentally Relevant Activity. It means that the Council should not be setting conditions for the management of the treatment process if these are provided by a government agency. 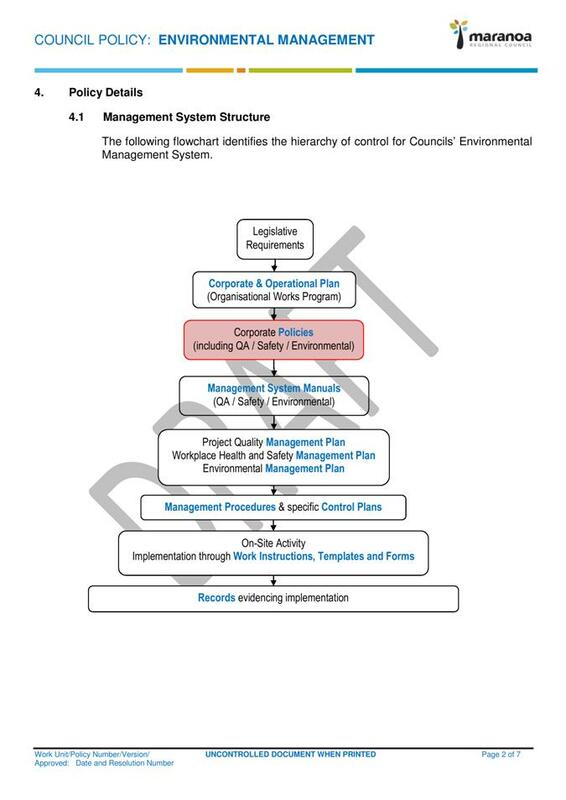 However, this means that the management (and enforcement) of conditions contained in an environmental authority primarily rests with the Department of Environment and Heritage Protection and is dependent on the willingness of that agency to take action now and into the future. 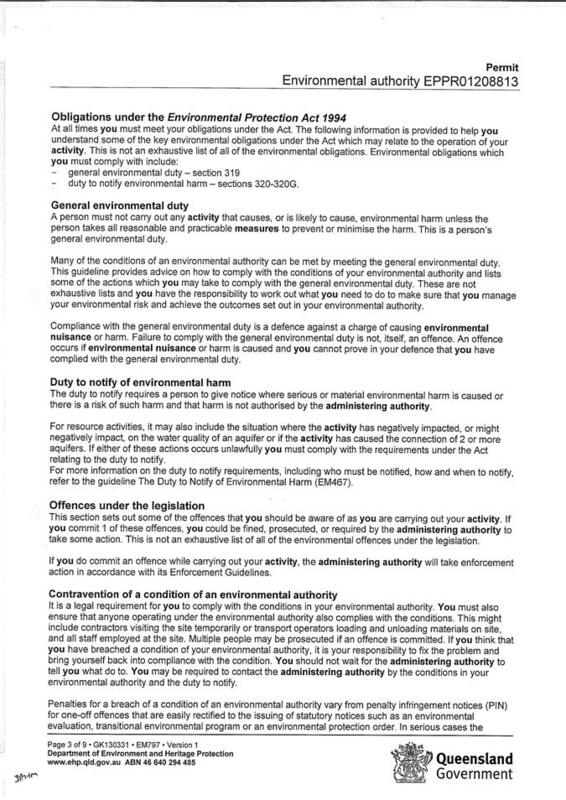 Further, it should be accepted that the defence of the environmental authority and its conditions should be left to the agency that imposed them. This will be relevant in any appeals. Council must still deal with impacts such as traffic, impacts on other land uses and the use of the site after the waste water treatment activity has ceased. It is possible for the operating company, which can also be the owner of the land, to cease operating and for the company to have insufficient assets left to meet the costs of site remediation, especially if the land is classed as contaminated. The development conditions therefore include the requirement for a long-term bond. To maintain the value of this bond, the relevant condition includes a provision that if any interest is earned on the bond during each completed financial year, interest equivalent to the percentage increase of the All groups consumer price index for Brisbane published by the Australian Statistician plus 0.5% will be added to the bond for that financial year. Any other interest will be retained by the Council for its own use. Irrespective of any interest earned on the bond, every year the Council will charge 0.5% of the total bond amount at the close of each financial year for bond administration expenses. After 10 years, the operator of the site can ask for a review of the bond arrangements with the written permission of the owner of the land. 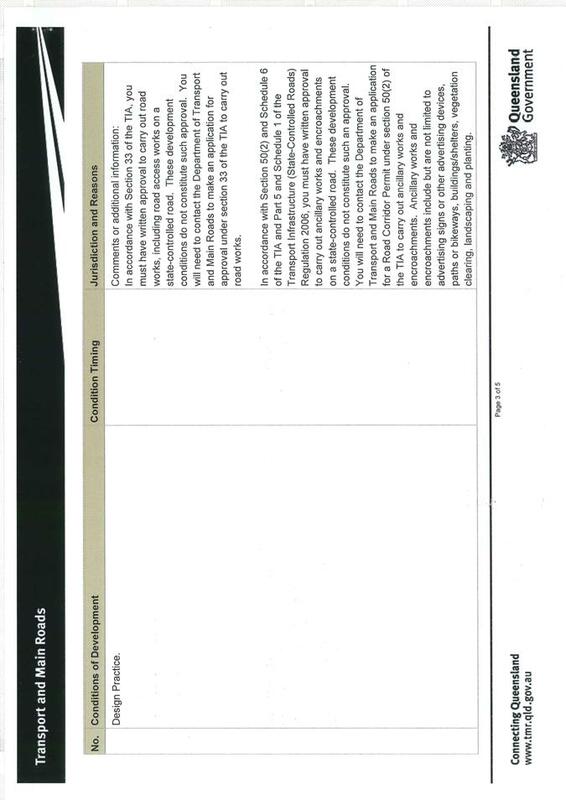 Any change to the bond arrangements will be based on the Council’s assessment of the risks presented by the site. As this is a very low cost approach to waste water disposal, it is feasible that Council will receive other development applications for similar methods of disposal. 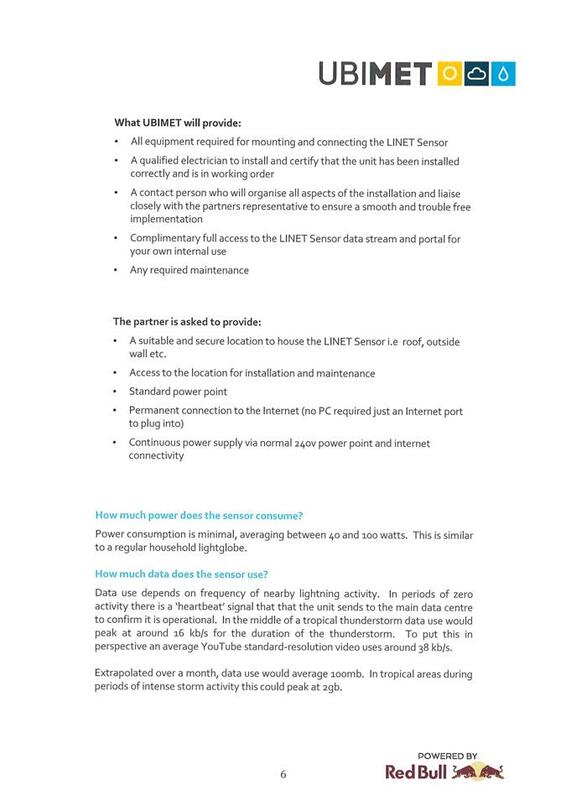 Some existing operators may not be able to compete with such a method without establishing similar low-cost facilities. These types of facilities are considered to be higher long-term risks than facilities which rely on immediate processing of waste water. Although the waste water facility has direct access onto a state controlled road, it will use local roads to access the locations where waste water will be collected for transport to the storage facility. A local roads additional impacts charge of $0.50 per tonne will be paid for all water transported to and from the site. This amount will be will be increased or decreased annually by a percentage equivalent to the change in All groups consumer price index for Brisbane published by the Australian Statistician. The holder of the development approval may ask for the local roads additional impacts charge to be reviewed once in every three year period after the approval for the facility was given. 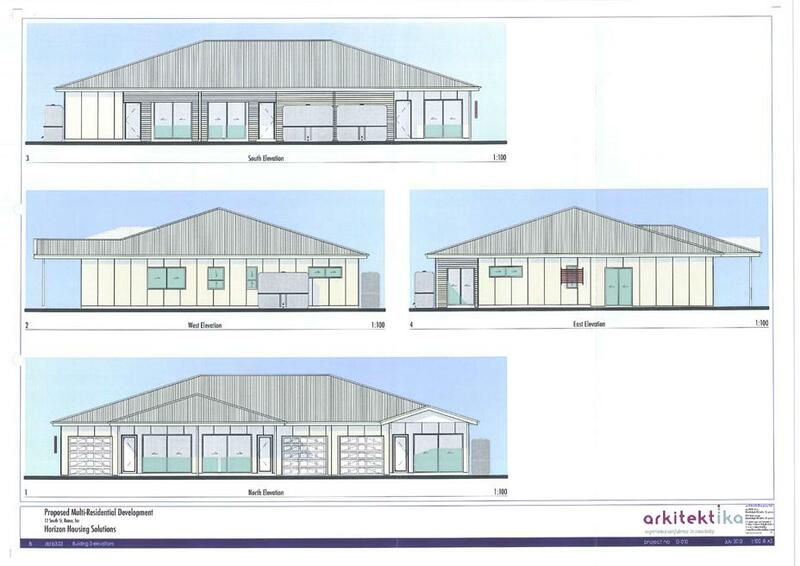 The review will take account of the rates and methodology applying to similar facility operators in the Council Area and the facts and circumstances applying to this approved facility. 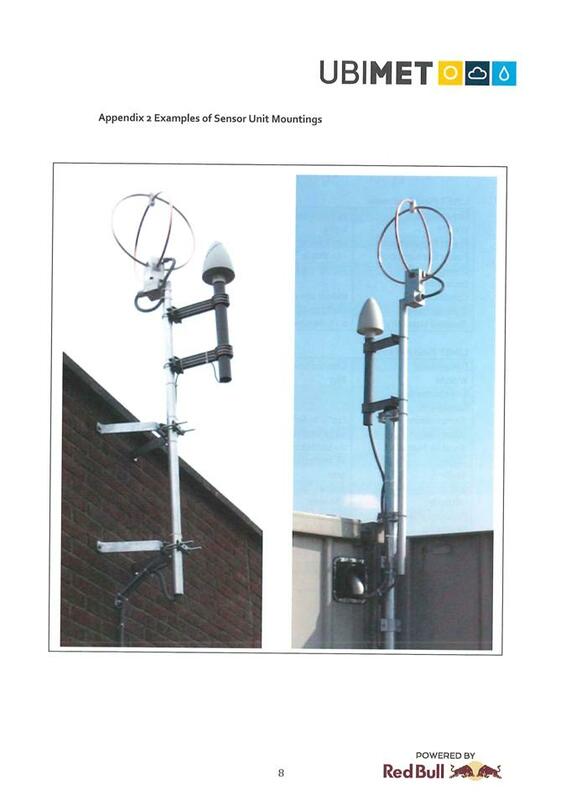 This is to be standard across all new developments in the rural area. The approval holder may enter into infrastructure agreements with the Council at any time to deal with matters covered by this approval. The Council is not obliged to enter into any such agreements. The proposed approach is based on Department of Environment and Heritage Protection being responsible for the management of the conditions it has imposed. 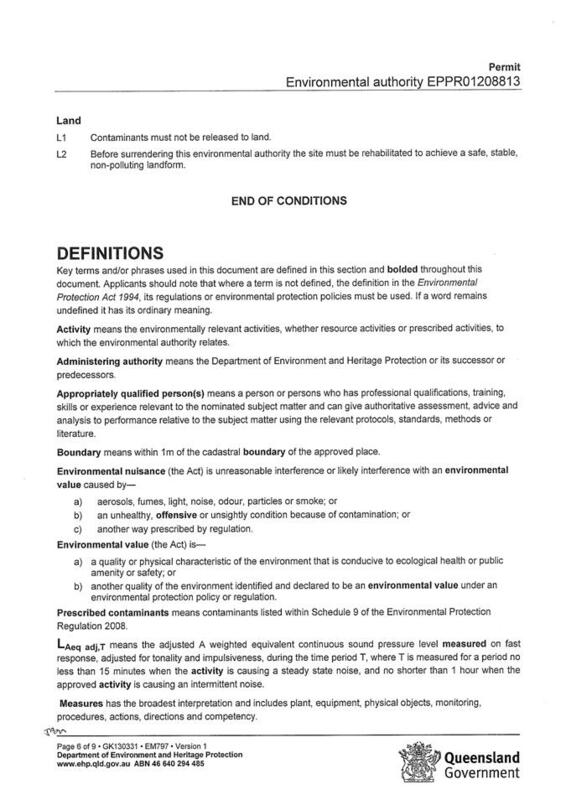 Council is obliged by law to appear and take reasonable steps to defend any approval issued by Council as an assessment manager, but the costs of defending the environmental conditions imposed by the Department of Environment and Heritage Protection will largely be the responsibility of that agency. The development approval includes a local roads additional impacts charge of $0.50 per tonne. 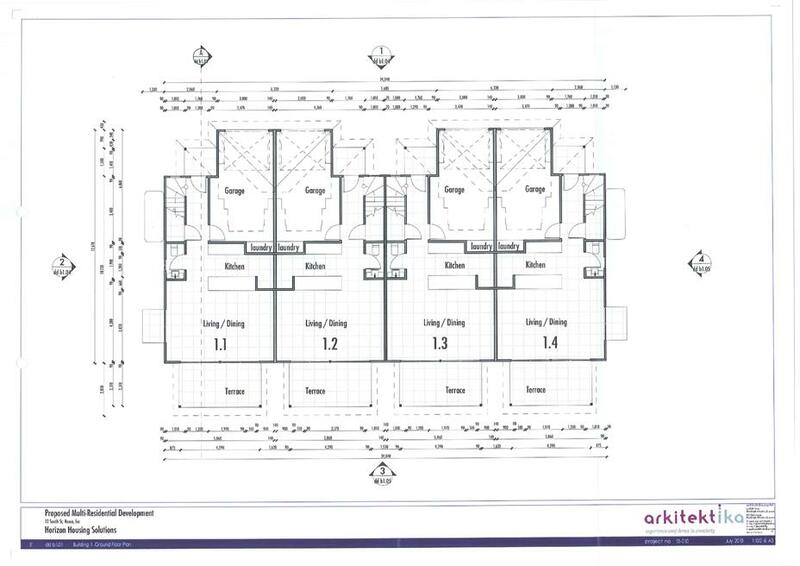 The development proposal is for a material change of use to establish 18 accommodation units on land situated at Jackson Street and South Street, Roma, (described as Lots 3, 4 and 5 on SP179588, and Lot 6 on SP184948). The development site is located within the Residential Zone. The site is bound by South Street to the north and adjoins residential land uses to the east and west. South-west of the site is residential land occupied by the Masonic Lodge, the site of a Heritage Gas Well and a multiple unit development separated by Community Title. Directly south of the site is Council owned land zoned for Recreation. 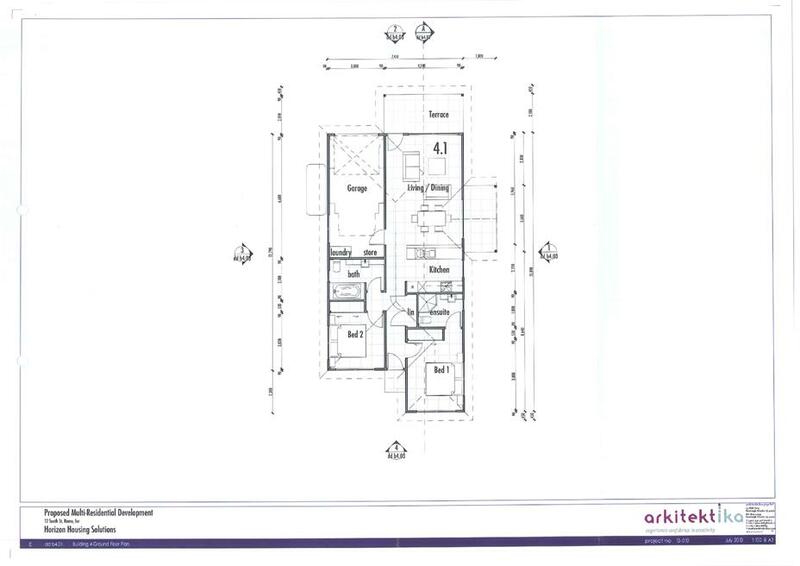 The development site comprises four allotments with a combined area of 8,303m2. 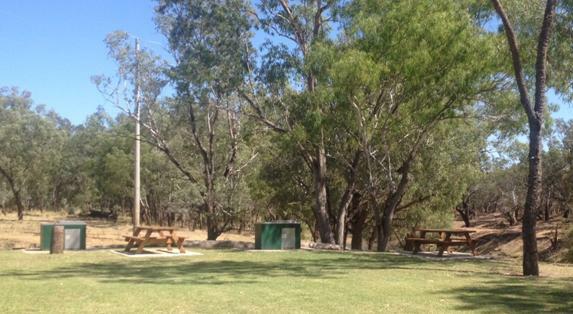 A single storey duplex is located within the north eastern portion of the site and the Masonic Lodge carpark is located within the western portion of the site. 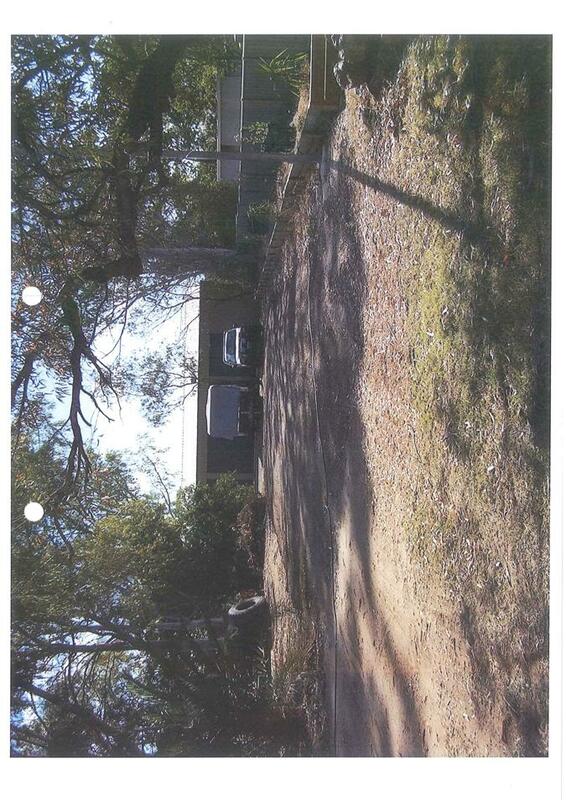 An approval to reconfigure the development site was recently granted by Council on 21 October 2013. 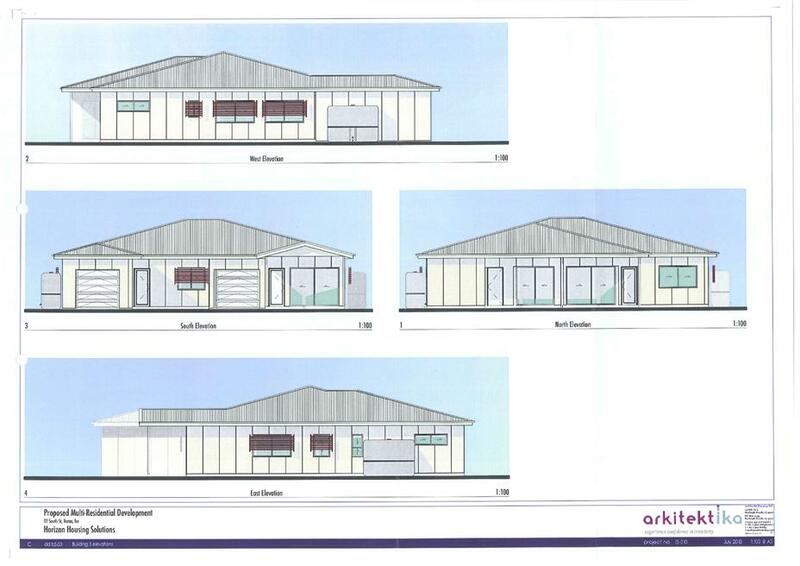 The approved configuration is intended to retain the single storey duplex and Masonic Lodge carpark on individual allotments and allow the development to be established on the balance area without encroaching the boundaries of any adjoining land uses. 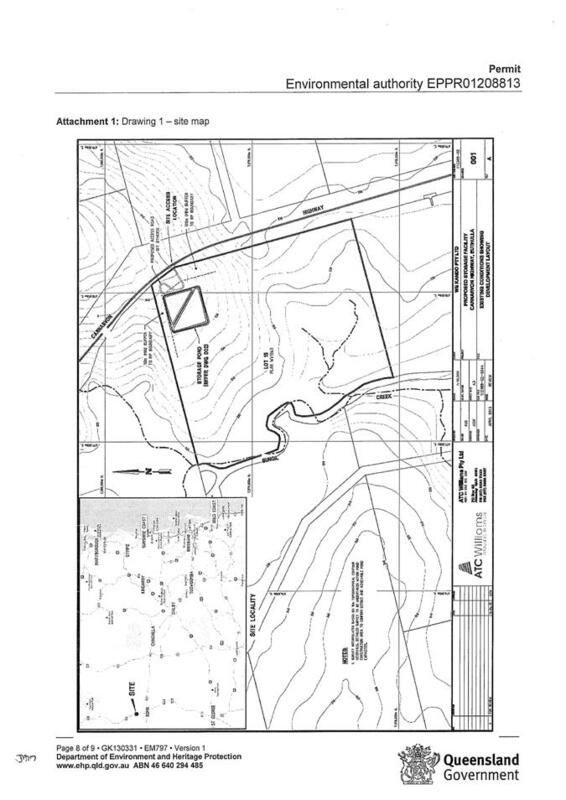 The proposed lot encompasses an area of 5,885m2. The principal frontage of the site is South Street to the north. The proposed lot will have a secondary frontage to Jackson Street which will permit vehicle access to the rear of the site. 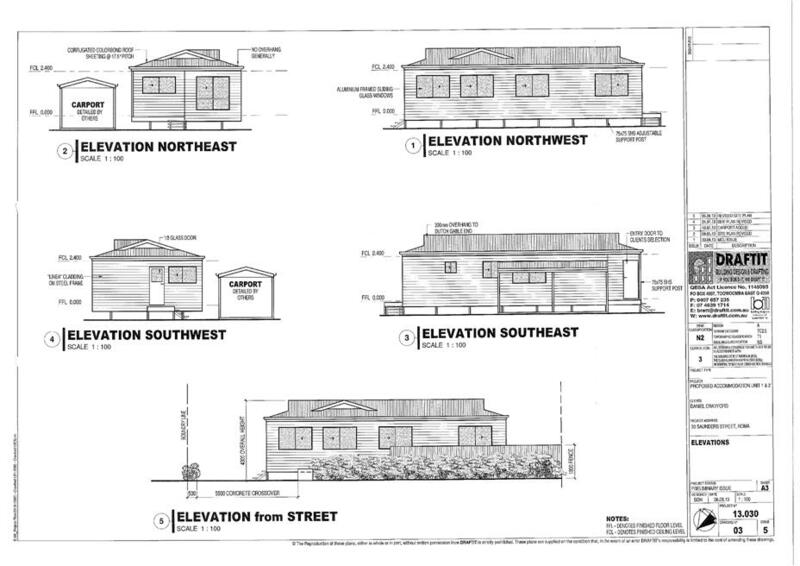 The proposed dwelling units will be contained within seven buildings. Building 1 will front South Street, Buildings 2 and 3 are located centrally within the site, Buildings 4 and 5 are located along the eastern boundary of the site and Buildings 6 and 7 are located along the southern boundary. Building 1 will be accessed via two crossovers to South Street. 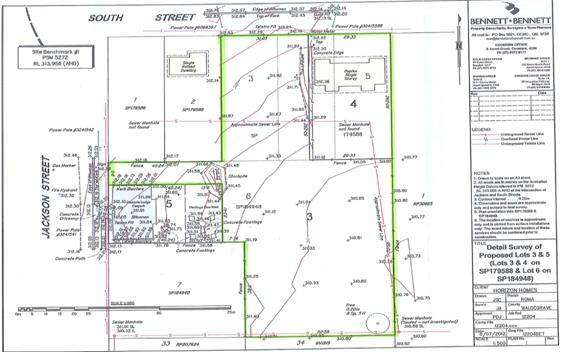 Buildings 2-7 will be accessed by an internal driveway off Jackson Street. 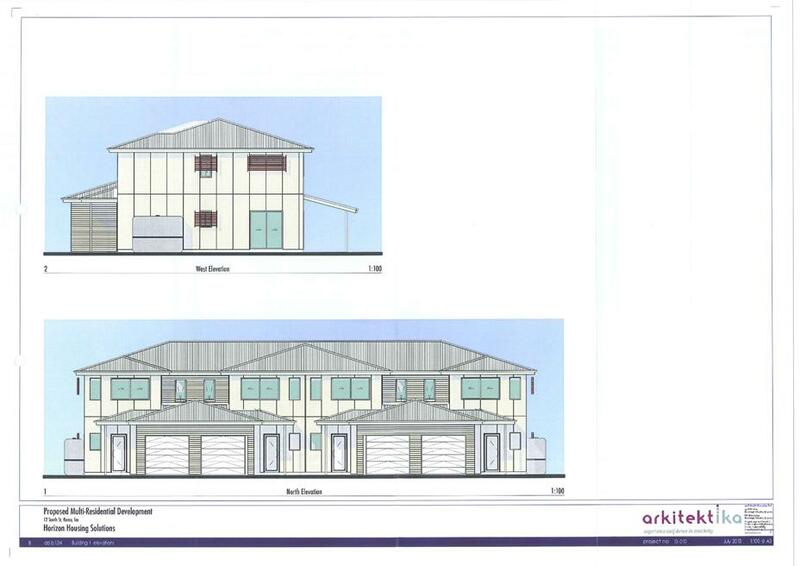 All proposed dwelling units incorporate a single garage. As registered land owner of the subject site, Council has provided written consent to the lodgement of the development application. 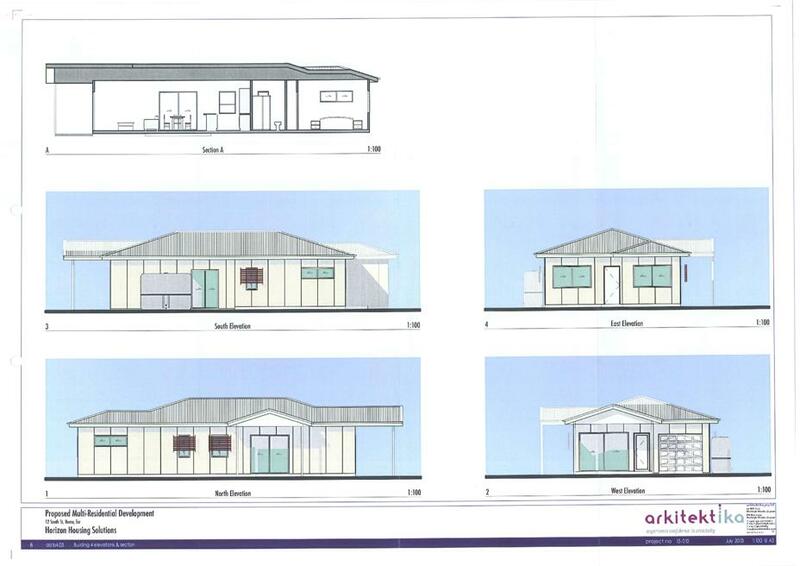 Council recognised the need for affordable housing and subsequently invited non-for-profit organisations to submit proposals to provide housing company services to the region. As the successful applicant, Horizon Housing was offered the opportunity to develop the subject land and has proposed to construct townhouses for affordable sale and rent. Council has agreed to transfer the land to Horizon Housing, accepting built product as compensation. It is proposed the development be undertaken in two stages to reduce the upfront capital outlay required, and minimise risk associated with oversupplying the market. 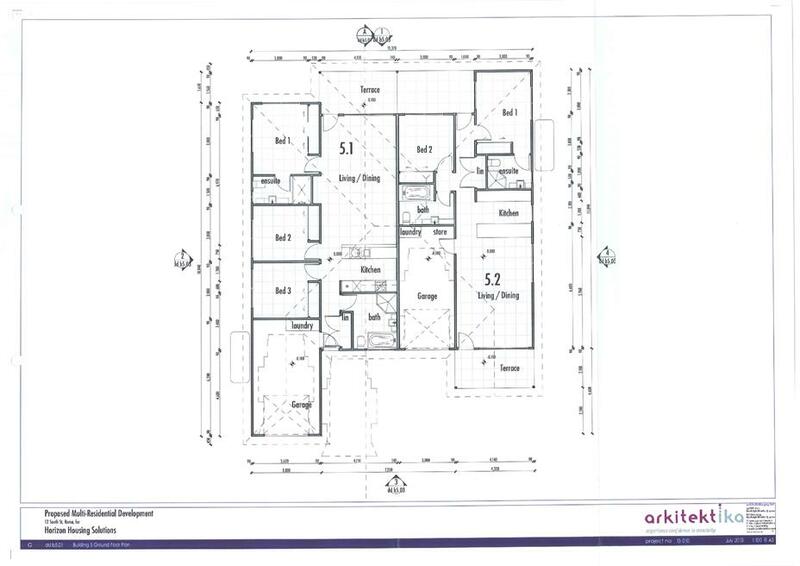 Stage 1 comprises 10 units (Buildings 1-4) and Stage 2 comprises eight units (Buildings 5-7). The application is subject to Impact Assessment against the relevant provisions of the planning scheme. 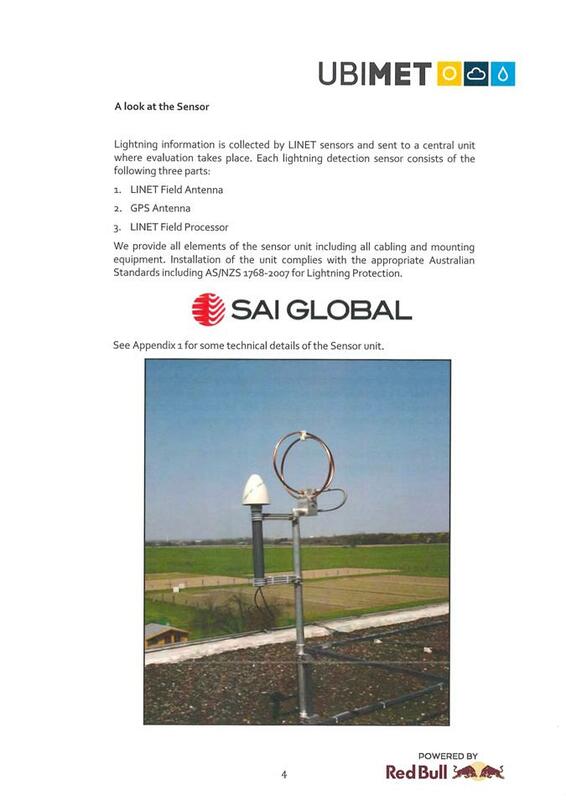 Public Notification was carried out from 19 September 2013 to 11 October 2013. 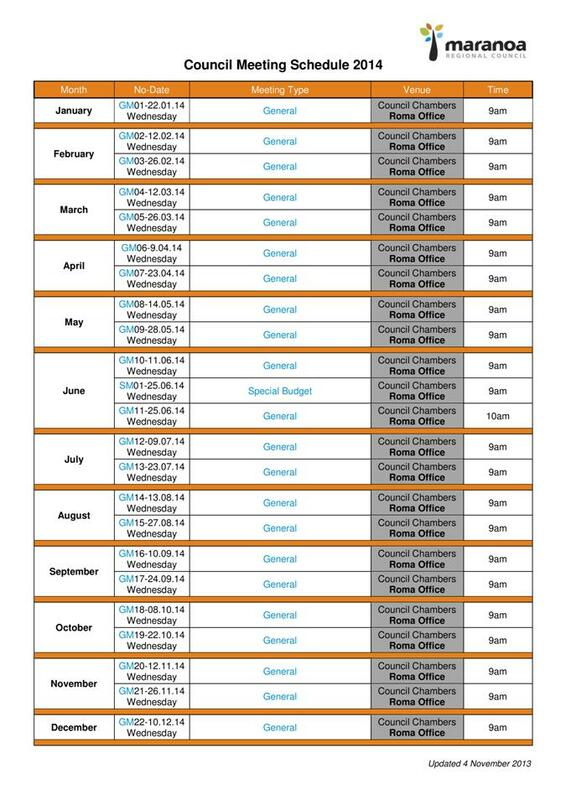 No submissions were received during this period. The site is situated within a developed urban area and will not result in the removal of any vegetation, or impact on any other environmentally significant areas, including wetlands, habitats, corridors and open spaces. The proposal is for a residential use and will not adversely impact on water or air quality nor the biodiversity of the area. The subject site is not identified as being in proximity to, or a place of, cultural heritage significance. The development does adjoin the site of a Heritage Gas Well to the west, however appropriate separation distances are provided ensuring the proposed use will not have any adverse impacts on the site. The proposal is for a residential development located within the Residential Zone. The development will not compromise the location of business and commercial development with the Commercial Zone and CBD. The development site is not located in proximity to the CBD. The proposed use is a residential activity that will not adversely impact on the efficiency, attractions or vitality of the commercial area. The proposal is for residential development within the Residential Zone and will not adversely impact on the promotion of tourism within the region. The development site is located within an established residential area with the necessary infrastructure available to service the proposed use. The development site is not located in proximity to major water cycle or electricity infrastructure. Site access will be obtained via South Street and Jackson Street which are designed to cater for traffic expected within a residential area. The site is separated from the railway corridor to the south by an undeveloped allotment within the Recreation Zone. A minimum distance of approximately 80 metres separates the development site from the railway corridor. The development will not encroach or adversely impact on the operation of the railway network. The development site is located within an established residential area with infrastructure and services available to provide a suitable living environment for residents of the dwelling units. The development will contribute to the local streetscape by providing housing diversity, whilst remaining sensitive to the rural amenity of the town through a design that is consistent with the scale, siting and character of the local area. Site landscaping will contribute to the amenity of the development and local area. 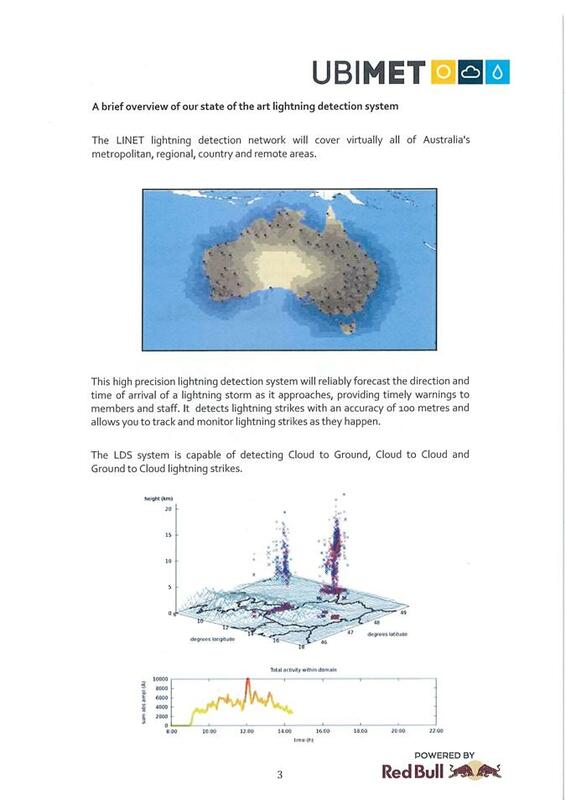 The site is not identified as being susceptible to bushfire, flood or other hazards. 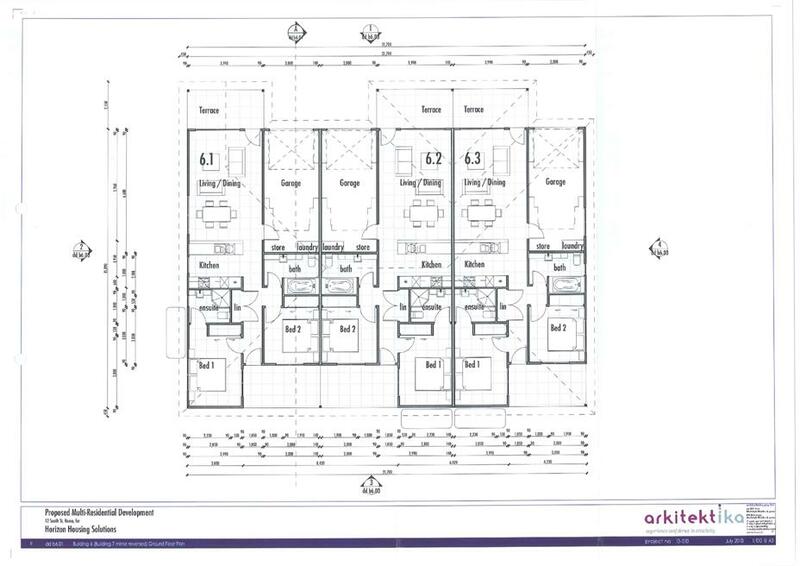 The development will increase the range of housing available in Roma through the provision of 18 dwelling units. The proposal is for a residential use located within the Residential Zone. The development will minimise adverse impacts to surrounding residential uses through fencing, landscaping, sufficient onsite parking and manoeuvring areas and the control of lighting emissions. 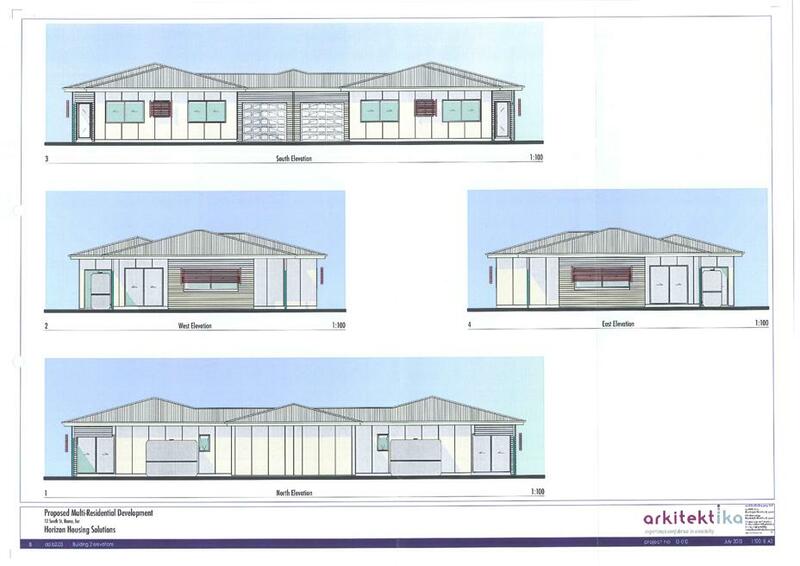 The proposed development will provide residential accommodation to support a range of activities in Roma. The development is limited to two storeys in height. 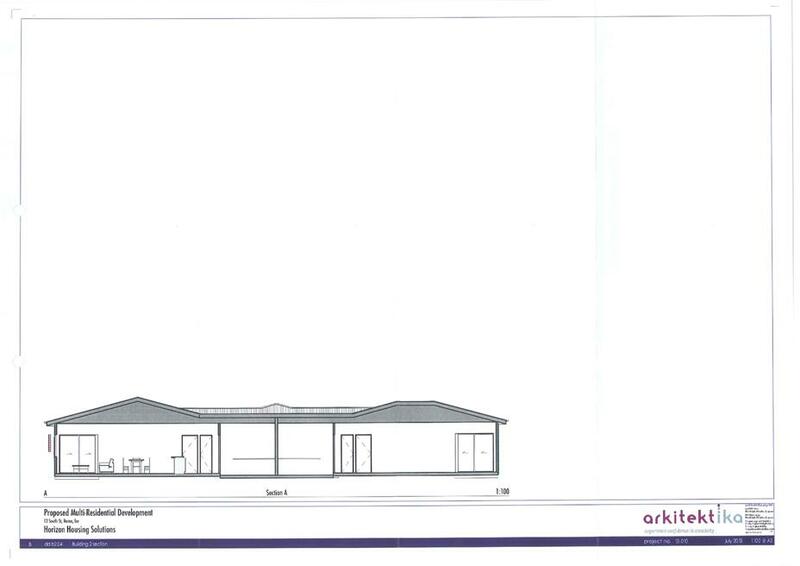 All proposed buildings will be constructed with a pitched roofline and building materials that are in keeping with residential premises in the Urban Area. Site landscaping will enhance the amenity of the local streetscape. The proposed development is appropriately located within a residential area. Vehicle access to the car parking associated with Building 1 will be provided via two crossovers to South Street. Vehicles will be required to make a reversing manoeuvre in order to exit to South Street, however the building setback will provide motorists with an unobstructed view of the roadway and ensure pedestrians and cyclists have visibility of vehicle manoeuvres out of the site. Vehicle access to Jackson Street will be dual lane. 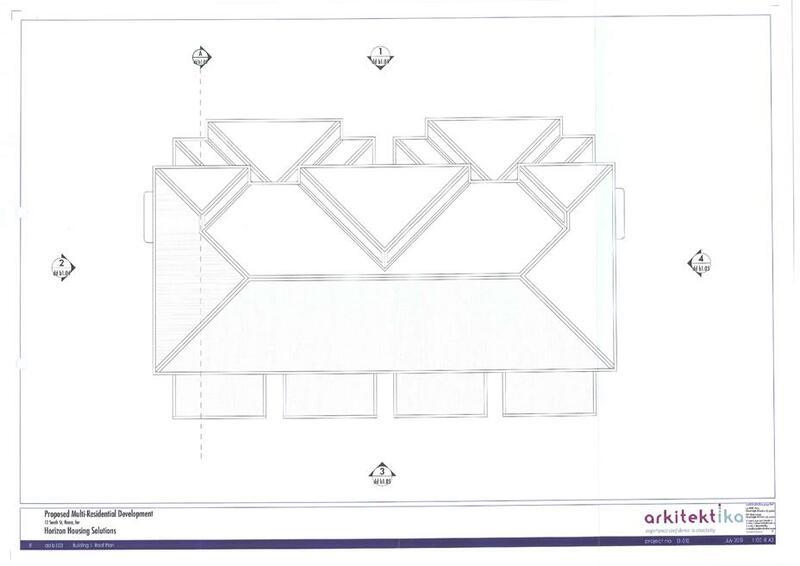 Manoeuvring areas will be provided within the site to allow vehicles to exit to Jackson Street in forward direction. The development site is located on a local residential access street which is designed to cater for residential traffic. All proposed buildings will be setback an appropriate distance from the South Street and Jackson Street roadways and will not impact on motorist visibility or compromise the function of the local road network. The development site is separated from the railway corridor to the south by a parcel of land dedicated for Recreation. The separation distance from the railway corridor is approximately 80 metres. The development will not impact on the operation of railway infrastructure. The development site is located in an established residential area with access to community services and facilities. The development will increase housing diversity in Roma Town. 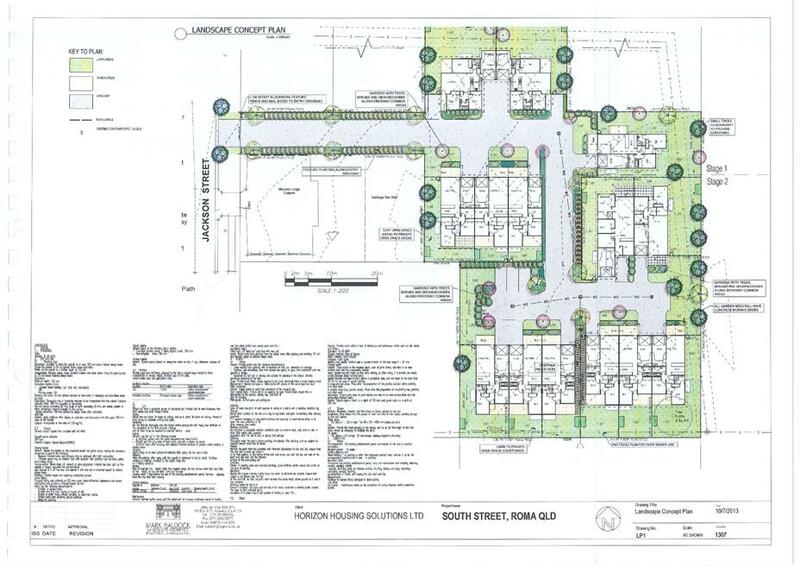 The development site is located within an established residential area that has access to infrastructure required to service the proposed use. The proposed development gains access to Jackson Street and South Street which are bitumen sealed with kerb and channel. Access to Building 1 (comprising 4 units) will be provided via South Street. A common driveway will provide access to Buildings 2-7 via Jackson Street. The development incorporates a total of 41 onsite car parking spaces including 36 resident car parks (1 covered and 1 tandem uncovered space per unit) and five visitor parking spaces. The internal driveway is of sufficient width for vehicles to enter and exit the site simultaneously. The driveway layout provides adequate manoeuvring areas for vehicles to exit the onsite parking spaces and access the roadway in forward direction. Vehicles parked at Building 1 will need to perform a reversing manoeuvre to exit the site to South Street. Building 1 will be appropriately setback from the front boundary allowing motorists to have clear visibility when entering the roadway. The proposed development is not contiguous to a State controlled road and will not impact on their function as a link between major centres. The proposed development is located on a local residential access street and will not be adversely impacted by noise generated from road traffic. The development site is located approximately 80 metres from the rail corridor to the south. The proposed use will not impact on the operation of the rail network. Not Applicable - The site is not located in proximity to watercourses. Not Applicable - The development site is not located within the 1 in 100 year flood overlay. 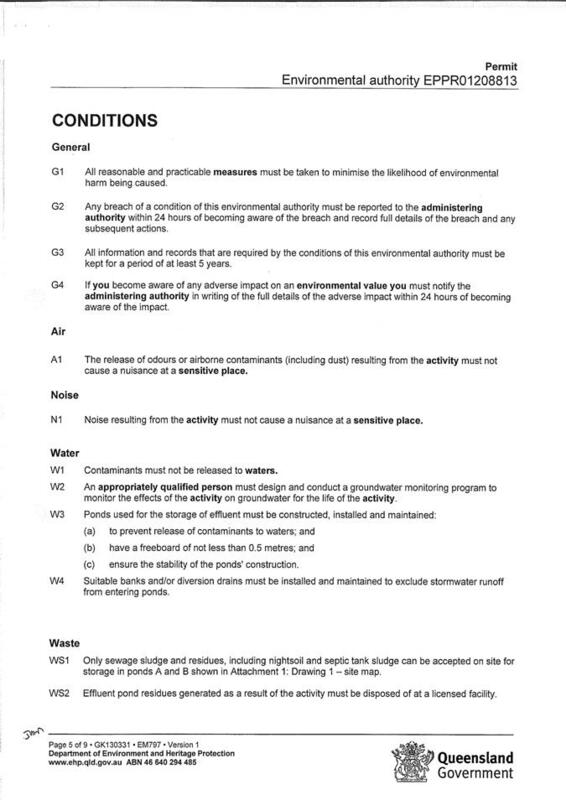 Conditions of approval will require any excavation and filling to be undertaken in accordance with Schedule 7: Standards for Construction Activity. The proposed development is not located within a Medium or High Bushfire Hazard Area. The development is not located in proximity to places of known indigenous or cultural heritage value. The proposed development is limited to two storeys and a maximum height of 8.5 metres above natural ground level. The building height is consistent with land uses in the surrounding urban area. 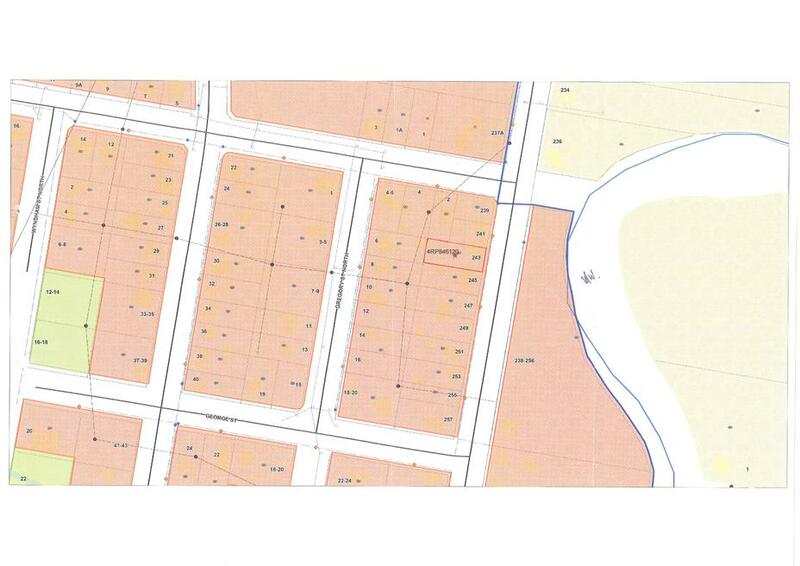 The footprint of the proposed buildings will occupy 1977.5m2 of the site, equating to 33.6% site coverage. The development is sensitive to the local character in this respect. Building 1 is setback 7.0 metres from the front boundary to South Street. 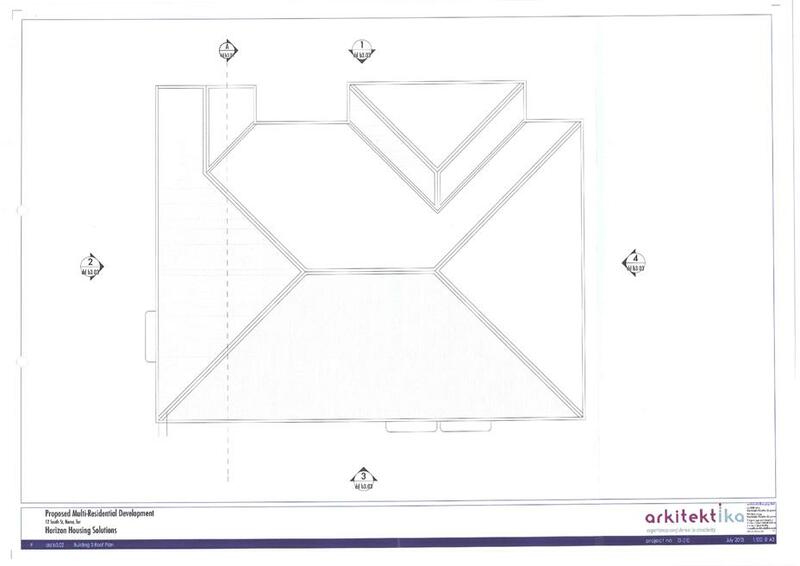 The eaves of the building will extend 450mm into this setback, however the development will still exceed the setback of the adjacent dwelling. It is considered a setback of 6.55 metres to the frontage will not adversely impact on the streetscape. All buildings are well setback from the Jackson Street frontage of the site which is utilised to provide vehicle access to the internal parking areas. A minimum 3.0 metre setback is provided to all side boundaries of the site. The setback from Buildings 6 and 7 to the rear boundary is 4.5 metres, which does not comply with the 7.0 metre setback requirement. The adjoining land to the rear of the site is zoned for Recreation and facilitates stormwater drainage to the Railway Dam. A relaxation of the rear boundary setback is not considered to compromise the residential amenity of the area. The development has been designed to achieve adequate ventilation and natural lighting for the dwelling units. Screen fencing will be established along site boundaries and internally within the site to delineate areas of private open space for each dwelling unit and maintain privacy for residents of adjoining properties. Conditions of approval will require site landscaping to be provided in accordance with the landscaping plan submitted with the development proposal. 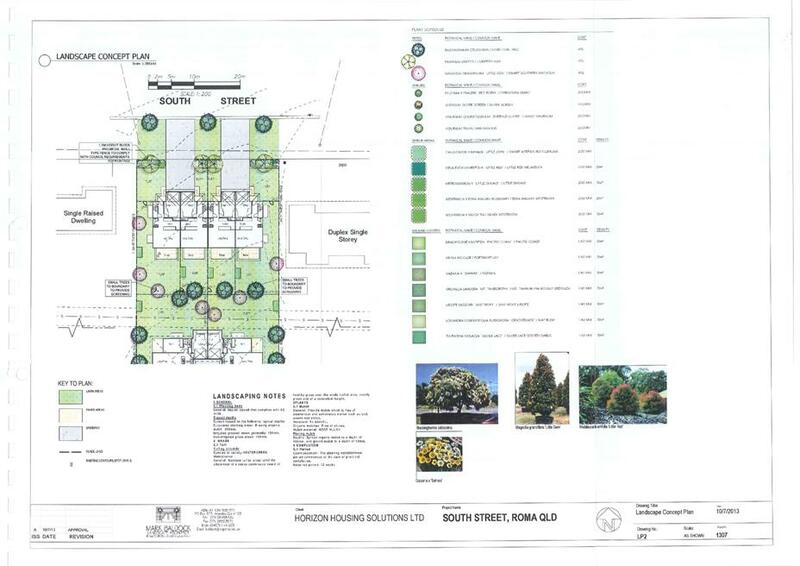 The landscaping plan includes the establishment of gardens containing a variety of trees, shrubs and ground covers established alongside the internal driveway and car parking areas. 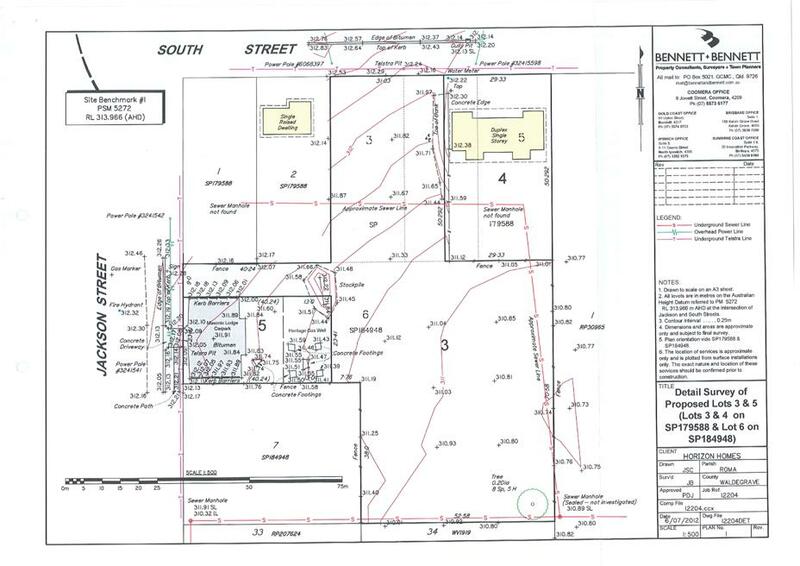 The plan also incorporates various trees adjacent to the property boundaries. 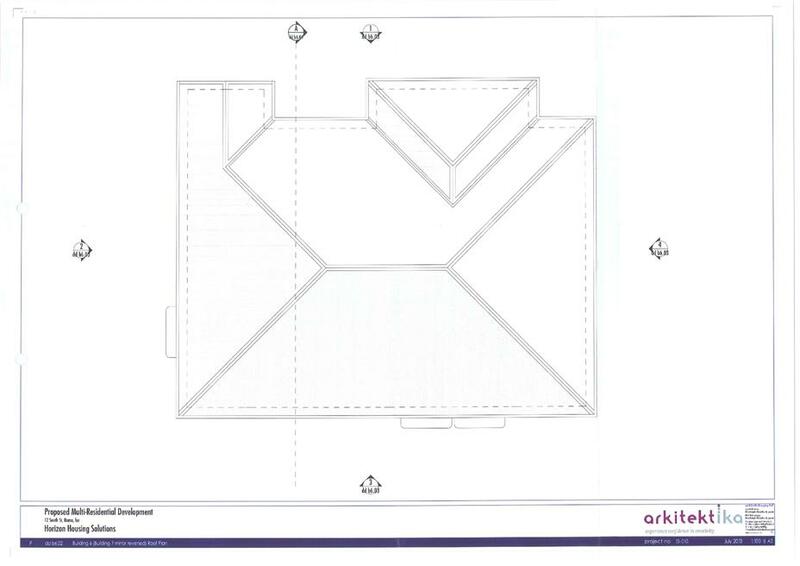 Unsealed areas of the site, including the private open space areas of the dwelling units, will be turfed. Site landscaping will contribute to the overall amenity of the development and local streetscape. Landscaping will also provide a level of screening and privacy for residents of the dwelling units. 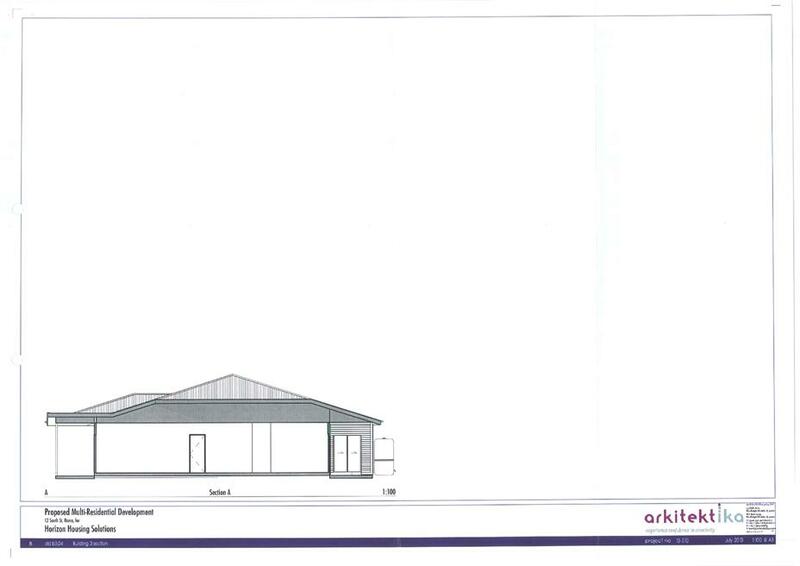 Not Applicable – the development does not incorporate residential outbuildings. Although the proposed development requires assessment against the Impact Assessable provisions of the planning scheme, the development does not conflict with the intent of the Residential Zone within which it is to be located. The development will contribute to the range of housing available in Roma whilst remaining sensitive to the local character and amenity through a design that is appropriately scaled and compatible with the local area. 4. 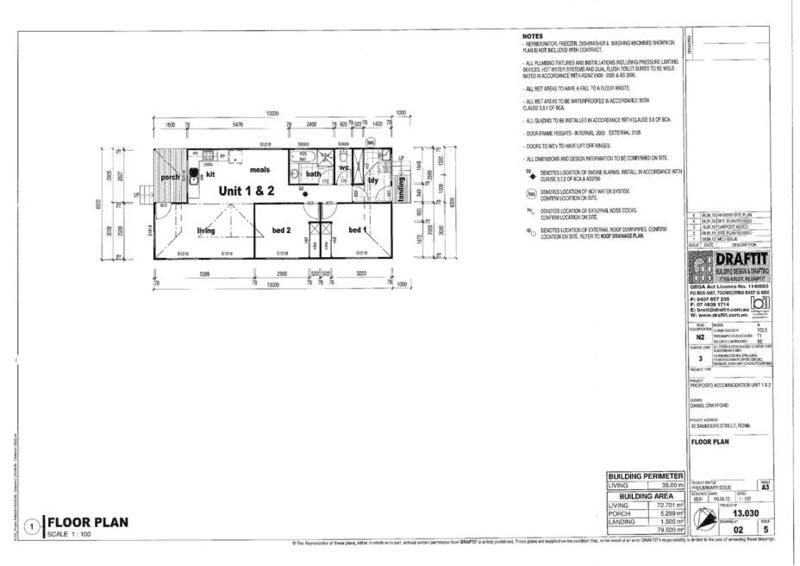 Development Approval 2013/18702 for a Material Change of Use - “Accommodation Units” situated at 36 Jackson Street and 8-12 South Street, Roma Qld 4455, and described as Lot 6 on SP184948 and Lots 3-5 on SP179588. $291,000.00 is payable as infrastructure charges. This is based on an adopted charge of $15,000.00 per 2 bedroom dwelling unit and $21,000.00 per 3 bedroom dwelling unit. 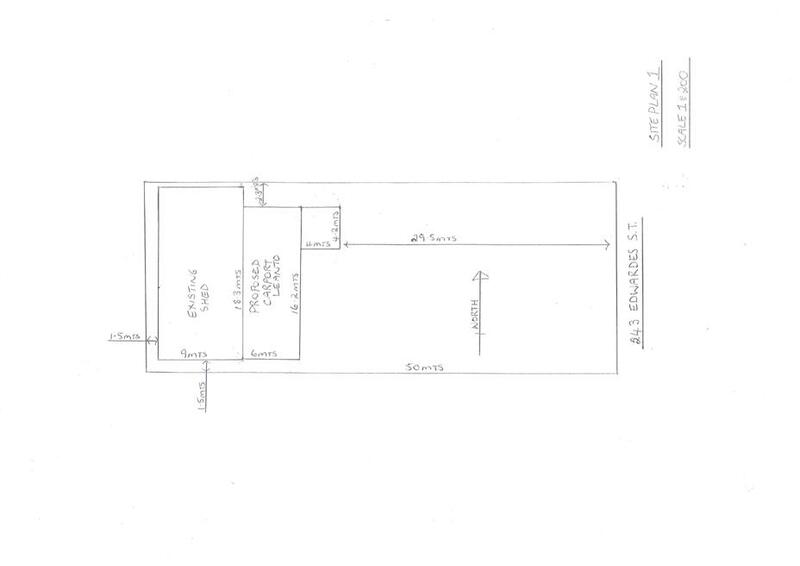 This charge is levied in respect of a Development Approval for a Material Change of Use “Accommodation Units”, situated at 36 Jackson Street and 8-12 South Street, Roma Qld 4455, and described as Lot 6 on SP184948 and Lots 3-5 on SP179588. Prior to construction of the approved use. That Council authorises the Acting CEO to sign off the provided Memorandum of Understanding between Council and Horizon Housing Company. 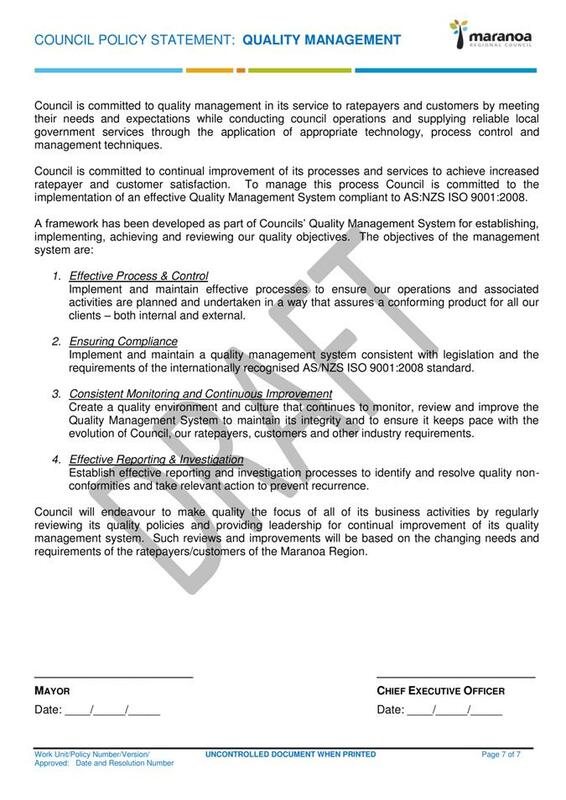 This action sheet has been automatically been produced by Executive Services using InfoCouncil, the agenda and minutes database. Please complete all subsequent notes in relation to this action in InfoCouncil. Review of and suggested improvements to the provision of Public Toilets in Surat.